화학식 1의 폴리옥시알킬렌 유도체. The polyoxyalkylene derivative of the general formula (I). X는 탄소수 3 내지 30의 2가 탄화수소 그룹을 나타낸다. X is a divalent C 3 -C 30 represents a hydrocarbon group. 본 발명은 폴리옥시알킬렌 유도체 및 이의 제조방법에 관한 것이다. The present invention relates to a method for producing a polyoxyalkylene derivative and derivatives. 보다 구체적으로, 본 발명은 생물학적 물질(예: 폴리펩타이드, 생리학적 활성 단백질 또는 효소)의 개질 및 약물 전달 시스템(이후에는 DDS)(예: 리포좀 및 중합체 마이셀)의 개질에 유용한 폴리옥시알킬렌 유도체에 관한 것이다. More particularly, the present invention is a biological material useful polyoxyalkylene derivative to the reforming of: (liposomes and polymeric micelles Example) modification and drug delivery systems (hereinafter DDS) (such as polypeptides, physiologically active proteins or enzymes) relate to. 말단 개질된 폴리옥시알킬렌 화합물은 최근들어 DDS에 중요한 담체로서 주목받고 있다. Terminal modified polyoxyalkylene compounds have recently attracted attention as an important carrier for DDS. 특히, 폴리옥시알킬렌 화합물을 사용한 폴리펩타이드, 생리학적 활성 단백질 또는 효소 등의 개질 및 폴리옥시알킬렌 화합물을 사용한 리포좀 또는 중합체 마이셀 등의 개질은 항원성(면역반응성)의 감소, 약물 안정성의 증가 및 체내 지속시간의 연장과 같은 효과를 나타낸다. In particular, the polyoxyalkylene-modified, such as modified and polyoxyalkylene liposomes or polymer micelles with a compound such as alkyl poly with alkylene compound peptides, physiologically active proteins or enzymes, the reduction of antigenicity (immunoreactivity), increase of drug stability and an effect such as extension of the duration of the body. 말단 개질된 폴리옥시알킬렌 화합물로는, 펩타이드 또는 단백질의 측쇄 작용 그룹(예: 리신 잔기의 아미노 그룹, 아스파르트산 또는 글루타민산 잔기의 카복실 그룹 및 시스테인 잔기의 티올 그룹) 또는 인지질 또는 중합체 마이셀 출발 물질의 아미노 그룹 또는 카복실 그룹과 반응할 수 있는 말단 작용 그룹으로서 카복시 그룹, 알데하이드 그룹, 아미노 그룹, 티올 그룹, 말레이미도 그룹 등을 갖는 화합물이 포함된다. Of: (a lysine residue of the amino group, aspartic acid or glutamic acid residue of a carboxyl group and a cysteine ​​residue of the thiol groups), or phospholipids or polymeric micelle starting materials terminated by the modified polyoxyalkylene compound is a peptide or protein side-chain functional groups of an amino group or a terminal functional group capable of reacting with a carboxyl group include compounds having a group such as a carboxy, an aldehyde group, an amino group, a thiol group, maleimido group. 특히, 말레이미도-말단화된 폴리옥시알킬렌 화합물을 사용한, 시스테인 잔기의 측쇄 티올 그룹 또는 리신 잔기에 도입된 티올 그룹의 개질은 다른 개질 방법에 의해 형성된 다른 결합보다 강한 티오에테르 결합을 형성한다. In particular, the maleimido-and modification of the horse with a shoe polyoxyalkylene compound, introduced into the side chain thiol groups, or a lysine residue of a cysteine ​​residue the thiol groups form strong thioether bond than another bond formed by other modification methods. 개질에 사용되는 말레이미도 말단 그룹을 갖는 통상의 폴리옥시알킬렌 화합물은 폴리에틸렌 글리콜 또는 메톡시폴리에틸렌 글리콜을 N-하이드록시석신이미드와 6-말레이미도카프론산의 에스테르 등과 반응시킴으로써 제조하였다. Conventional polyoxyalkylene compounds having a maleimido end group used for the modification was prepared by reacting with polyethylene glycol or methoxy polyethylene glycol, a N- hydroxy-succinimide and 6-maleimido caproic acid esters. 그러나, 이들 폴리옥시알킬렌 화합물은 폴리옥시알킬렌 쇄와 말레이미도 그룹 사이에 에스테르 결합을 함유하므로, 생체내에서 용이하게 가수분해된다. However, these polyoxyalkylene compounds contain an ester linkage, so between the polyoxyalkylene chain and the maleimido group, it is easily decomposed in vivo hydrolysis. WO92/16221, WO98/3887, JP-A-12-191700 및 문헌[참조 문헌: Proc. WO92 / 16221, WO98 / 3887, JP-A-12-191700 and described in reference books: Proc. Natl. Natl. Acad. Acad. Sci. Sci. USA, 97(15) (2000), pp. USA, 97 (15) (2000), pp. 8543-8553 및 Biochem. 8543-8553 and Biochem. J., 351 (1) (2000), pp. J., 351 (1) (2000), pp. 87-93]에 기재되어 있는 α-말레이미도에틸옥시-ω-메톡시(폴리옥시알킬렌)은 유사하게 낮은 저장 안정성을 갖는다. 87-93] α- maleimido ethyloxy -ω- methoxy (polyoxyalkylene), which is described in has a similarly low storage stability. 의학용의 말단 개질된 폴리옥시알킬렌 화합물은 목적하는 화합물보다 고분자량의 불순물이 거의 없어야만 하고 활성 그룹의 치환도가 높아야 한다. Terminal modified polyoxyalkylene compounds for medical purposes are compounds than high molecular weight impurities in the substantially free only to, and is in the active group substitution degree higher. 따라서, GPC 순도가 높으며 말단 활성 그룹으로의 치환도가 높은 말단 개질된 폴리옥시알킬렌 화합물이 요구되고 있다. Thus, there is a high GPC purity requirements are substituted with a high degree of terminal modified polyoxyalkylene compounds with a terminal active group. 문헌[참조 문헌: Synthetic Communications, 22(16)(1992), pp. Described in Reference: Synthetic Communications, 22 (16) (1992), pp. 2425-2429] 에는 폴리옥시알킬렌 쇄와 말레이미도 그룹 사이에 C 2 알킬 그룹을 갖는, 말레이미도 그룹-말단화된 폴리옥시알킬렌 유도체의 제조방법이 보고되어 있다. 2425-2429], the polyoxyalkylene chain and the maleimido between groups with C 2 alkyl group, maleimido group - it is reported a method of making a horse shoe polyoxyalkylene derivative. 보고된 상기 방법은 점화점이 낮은 다량의 디에틸 에테르를 중간체의 정제에 사용하기 때문에 산업적 제조용으로 적합하지 않은 것으로 간주될 수 있다. It reported the method can be considered to be unsuitable for producing industrially because it uses a large amount of diethyl ether to lower the ignition point in the purification of intermediates. 본 발명의 목적은 고순도이며 저장 안정성이 우수하고 생물학적 물질을 개질시키는데 유용한 폴리옥시알킬렌 유도체를 제공하는 것이다. An object of the present invention is of high purity and to provide a useful polyoxyalkylene derivative sikineunde excellent storage stability and modifying the biological material. 본 발명의 다른 목적은 안전한 고순도의 폴리옥시알킬렌 유도체를 제조하는 방법을 제공하는 것이다. Another object of the invention is to provide a method for producing a highly pure polyoxyalkylene derivative safe. 본 발명은 하기 화학식 1의 폴리옥시알킬렌 유도체를 제공한다. The present invention provides a polyoxyalkylene derivative of formula (1). X는 탄소수 3 내지 10의 2가 탄화수소 그룹을 나타낸다. X is a divalent hydrocarbon group having 3-10 carbon atoms represents a. 본 발명에 따르는 폴리옥시알킬렌 유도체는 바람직하게는 GPC 순도가 90% 이상이고 말레이미도 그룹 치환도가 90% 이상이다. The polyoxyalkylene derivative according to the invention is preferably a GPC purity of at least 90% and a maleimido group substitution degree is 90% or more. 본 발명의 폴리옥시알킬렌 유도체는 바람직하게는 pH 7 및 23℃에서 수행된 가수분해 안정성 시험에서 48 시간 이상의 말레이미도 그룹 치환도 반감기(50% 감소 시간)를 갖는다. The polyoxyalkylene derivative of the present invention preferably has a pH 7 and 23 ℃ the hydrolytic stability 48 hours or more maleimido group substitution degree half-life (50% reduction time) on the test carried out at. 화학식 1의 폴리옥시알킬렌 유도체 중에서, Z가 3 내지 8개의 하이드록실 그룹을 갖는 화합물의 잔기이고 a 및 b가 식 3≤a+b≤8 및 1≤b를 만족시키는 화학식 1의 폴리옥시알킬렌 유도체가 바람직하다. Among the polyoxyalkylene derivative of formula (1), a polyoxyalkylene of the formula (1) of the Z moiety of the compound having 3 to 8 hydroxyl groups, and a and b satisfies the equation 3≤a + b≤8 and 1≤b the alkylene derivatives. 본 발명에 따르는 폴리옥시알킬렌 유도체는 바람직하게는 생물학적 물질의 개질용으로 사용된다. The polyoxyalkylene derivative according to the invention is preferably used for the modification of the biological substance. 화학식 1의 폴리옥시알킬렌 유도체 중에서, X가 탄소수 3의 2가 탄화수소 그룹인 화학식 1의 폴리옥시알킬렌 유도체가 바람직하다. Among the polyoxyalkylene derivative of the general formula 1, X is a polyoxyalkylene derivative of formula (1) divalent hydrocarbon group having a carbon number of 3 is preferred. 말레아미드산 말단 그룹을 이미드화시키는 단계를 포함하는, 화학식 1의 폴리옥시알킬렌 유도체의 제조방법을 제공한다. That already contains de solidifying step the maleic acid amide end groups, provides a method for producing a polyoxyalkylene derivative of the general formula (I). Z, AO, n, m, a, b, R 및 X는 상기 정의한 바와 같다. Z, AO, n, m, a, b, R and X are as defined above. 화학식 3의 아미노 말단 폴리옥시알킬렌 유도체는 바람직하게는 하기 화학식 2의 하이드록실-말단화된 폴리옥시알킬렌 유도체로부터 시안화시킨 다음, 수소화시켜 제조한다. Was prepared by following, cyanoborohydride from the end of the shoe polyoxyalkylene derivative-amino-terminal polyoxyalkylene derivative of formula (3) is preferably a hydroxylamine of formula (2). Z, AO, n, m, a, b 및 R은 상기 정의한 바와 같다. Z, AO, n, m, a, b and R are as defined above. 본 발명의 방법으로 수득된 화학식 4의 말레아미드산-말단화된 폴리옥시알킬렌 유도체는 바람직하게는 0.5중량% 미만의 말레산 무수물 함량을 갖는다. Maleic acid amide of the formula (4) obtained by the method of the invention the end of the shoe polyoxyalkylene derivative preferably has a maleic anhydride content of less than 0.5% by weight. 본 발명에 따르는 폴리옥시알킬렌은 생물학적 물질을 개질시키는데 특히 유용하다. Polyoxyalkylene according to the invention is particularly useful in modifying the biological material. 본원에서 사용되는 용어 "생물학적 물질"은 생체내의 생명 활성을 유지하는데 필수적인 물질 및 이와 관련된 물질을 의미한다. As used herein, the term "biological material" means a material integral with the associated material to maintain the active life in the living body. 생리학적 활성 물질, 구조 단백질 및 인지질이 상기 용어하에 포함된다. The physiologically active substances, structural proteins, and phospholipids are included under the term. 폴리리신 및 폴리글루타민산과 같은 합성에 의해 제조된 폴리(아미노산)이 추가로 포함된다. Polylysine, and poly (amino acid) prepared by a synthesis such as polyglutamic acid which is incorporated in addition. 생리학적 활성 물질로는 티올 그룹을 갖는 펩타이드(예: 글루타티온), 생리학적 활성 단백질(예: 헤모글로빈 및 인슐린), 효소(예: 리파제 및 프로테아제)와, 화학적 개질 또는 유전자 재조합에 의해 수득되는 펩타이드, 단백질 및 효소가 포함된다. A physiologically active substance is a peptide having a thiol group (e.g., glutathione), a physiologically active protein (e.g., hemoglobin and insulin), enzymes (such as lipases and proteases), a chemically modified or peptide obtained by genetic recombination, It includes proteins and enzymes. 구조 단백질로는 생체 조직을 구성하는 콜라겐 및 케라틴이 포함된다. In structural proteins include collagen and keratin constituting the biological tissue. 화학식 1의 폴리옥시알킬렌 유도체를 상세히 기술할 것이다. A polyoxyalkylene derivative of formula (1) will be described in detail. 화학식 1에서, Z는 2 내지 8개의 하이드록실 그룹, 바람직하게는 3 내지 8개의 하이드록실 그룹을 갖는 화합물의 잔기를 나타낸다. In formula 1, Z is 2 to 8 hydroxyl groups, and preferably represents a residue of a compound having 3 to 8 hydroxyl groups. 탄소수 2 내지 8의 화합물로는 에틸렌 글리콜, 프로필렌 글리콜, 부틸렌 글리콜, 글리세롤, 디글리세롤, 트리글리세롤, 테트라글리세롤, 펜타글리세롤, 헥사글리세롤 및 펜타에리트리톨이 포함된다. A compound having 2 to 8 are included ethylene glycol, propylene glycol, butylene glycol, glycerol, diglycerol, triglycerol, tetra-glycerol, glycerol penta, hexa-glycerol and pentaerythritol. 에틸렌 글리콜, 글리세롤, 디글리세롤, 헥사글리세롤 및 펜타에리트리톨이 바람직하고, 글리세롤, 디글리세롤, 헥사글리세롤 및 펜타에리트리톨이 보다 바람직하다. Glycol, glycerol, diglycerol, hexadecyl glycerol and pentaerythritol are preferred, more preferably glycerol, diglycerol, hexadecyl glycerol and pentaerythritol. AO로 표현되는, 탄소수 2 내지 18의 옥시알킬렌 그룹으로는 옥시에틸렌 그룹, 옥시프로필렌 그룹, 옥시부틸렌 그룹, 옥시테트라메틸렌 그룹, 옥시스티렌 그룹, 옥시도데실렌 그룹, 옥시테트라데실렌 그룹, 옥시헥사데실렌 그룹 및 옥시옥타데실렌 그룹이 포함된다. , The oxyalkylene group containing 2 to 18 carbon atoms represented by AO is oxyethylene group, oxypropylene group, oxybutylene group, oxytetramethylene group, oxy styrene group, oxy dodecyl xylene group, oxy tetradecyl xylene group, oxy hexahydro to include the xylene group and oxy group, octadecyl xylene. 탄소수 2 내지 4의 옥시알킬렌 그룹이 바람직하며, 옥시에틸렌 그룹이 보다 바람직하다. And the oxyalkylene group having 2 to 4 carbon atoms preferably, more preferably an oxyethylene group. n 및 m은 각각 첨가된 옥시알킬렌 그룹 (AO)의 몰수를 나타내며, 각각 0 내지 2000 범위이며, 단, n 및 m이 둘다 0을 나타내지 않는다. 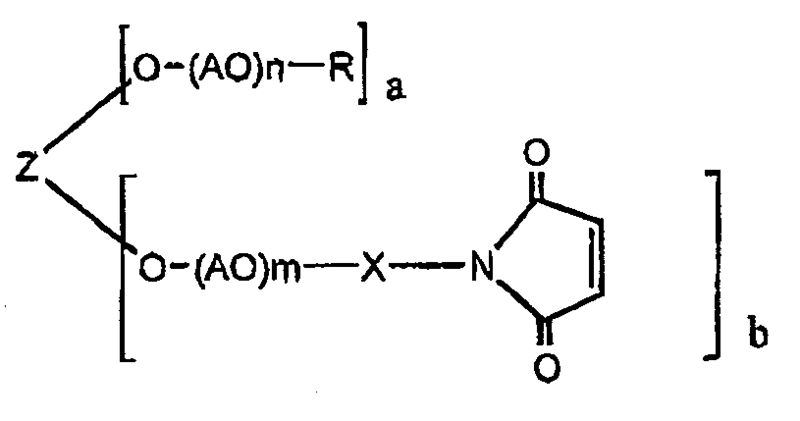 n and m are each the number of moles of the added oxyalkylene represents an alkylene group (AO), of 0 to 2000 range, where, n and m are not both represent 0. n 및 m은 각각 바람직하게는 20 내지 2,000, 특히 40 내지 1000의 범위이다. n and m are in the range of preferably 20 to 2,000, particularly 40 to 1000, respectively. n 및 m의 총계는 바람직하게는 20 내지 1,200, 특히 40 내지 400이다. The total number of n and m is preferably 20 to 1,200, particularly 40 to 400.
a 및 b는 각각 식 2≤a+b≤8 및 1≤b, 바람직하게는 3≤a+b≤8 및 1≤b를 만족시키는 폴리옥시알킬렌 쇄의 수를 나타낸다. a and b represents the number of polyoxyalkylene chains which satisfies the respective expressions 2≤a + b≤8 and 1≤b, preferably 3≤a + b≤8 and 1≤b. 생물학적 물질의 면역계로의 혼입은 생리학적 활성에 손상을 주지 않으면서 목적하는 개질 효과를 생성하는 2개 이상의 폴리알킬렌 쇄를 갖는 폴리옥시알킬렌 유도체를 사용한 생리학적 활성 물질의 개질에 의해 억제될 수 있다. Incorporated into the immune system of the biological material may be suppressed by a modification of physiologically active substance with a polyoxyalkylene derivative having two or more polyalkylene chain to generate modified desired effect without damaging the physiologically active can. 2개 이상의 말레이미도 말단 그룹을 갖는 폴리옥시알킬렌 유도체를 사용한 생리학적 활성 물질의 개질은 분자량을 증가시키며, 이는 면역계내로의 혼입을 억제하는데 보다 효과적이다. Modification of a physiologically active substance with a polyoxyalkylene derivative having two or more maleimido end groups increases the molecular weight, which is more effective in suppressing incorporation into the immune system. n, m, a 및 b는 폴리옥시알킬렌 유도체의 총 분자량을 결정하는 지표이다. n, m, a, and b is an index which determines the total molecular weight of the polyoxyalkylene derivative. 이들은 식 1≤(n×a+m×b)≤16,000, 바람직하게는 20≤(n×a+m×b)≤5,000, 보다 바람직하게는 40≤(n×a+m×b)≤1,200을 만족시킨다. These expression 1≤ (n × m × a + b) ≤16,000, preferably 20≤ (n × m × a + b) ≤5,000, and more preferably 40≤ (n × m × a + b) ≤1,200 to satisfy. 이러한 식이 만족되는 경우, 화학식 1의 폴리옥시알킬렌 유도체의 분자량은 250 내지 700,000, 바람직하게는 1000 내지 200,000, 보다 바람직하게는 2000 내지 50,000의 범위에 해당된다. If this expression is satisfied, the molecular weight of the polyoxyalkylene derivative of formula (I) are those in the range of 250 to 700,000, preferably from 1,000 to 200,000, more preferably 2000 to 50,000. R로 표현되는 탄소수 1 내지 30의 탄화수소 그룹으로는 지방족 탄화수소 그룹(예: 메틸, 에틸, 프로필, 이소프로필, 부틸, 이소부틸, t-부틸, 펜틸, 이소펜틸, 헥실, 헵틸, 2-에틸헥실, 옥틸, 노닐, 데실, 운데실, 도데실, 이소트리데실, 테트라데실, 헥사데실, 이소헥사데실, 옥타데실, 이소옥타데실, 옥타데세닐, 옥틸도데실, 도코실 및 데실테트라데실) 및 방향족 탄화수소 그룹(예: 벤질, 크레실, 부틸페닐, 디부틸페닐, 옥틸페닐, 도데실페닐, 디옥틸페닐, 디노닐페닐, 나프틸, 스티렌화된 페닐, p-메톡시벤질 및 트리페닐메틸)이 포함된다. A hydrocarbon group having 1 to 30 carbon atoms represented by R include aliphatic hydrocarbon groups (e.g. methyl, ethyl, propyl, isopropyl, butyl, isobutyl, t- butyl, pentyl, isopentyl, hexyl, heptyl, 2-ethylhexyl , octyl, nonyl, decyl, undecyl, dodecyl, isotridecyl, tetradecyl, hexadecyl, isohexadecyl, octadecyl, iso-octadecyl, octadecenyl, octyldodecyl, docosyl, and decyltetradecyl) and aromatic hydrocarbon group (e.g., benzyl, cresyl, butylphenyl, di-butylphenyl, octylphenyl, dodecylphenyl, dioctyl phenyl, dinonyl phenyl, naphthyl, a styrenated phenyl, p- methoxybenzyl, and triphenylmethyl ) it is included. 이중에서 메틸, 에틸, t-부틸, 옥타데실, 벤질, p-메톡시벤질 및 트리페닐메틸이 바람직하다. It is methyl, ethyl, t- butyl, octadecyl, benzyl, p- methoxybenzyl, and triphenylmethyl is preferred in dual. 메틸, t-부틸 및 벤질이 보다 바람직하다. Methyl, t- butyl, and benzyl is more preferable. X로 표현되는, 탄소수 3 내지 10의 2가 탄화수소 그룹으로는 직쇄 또는 측쇄 탄화수소 그룹(예: 트리메틸렌, 이소프로필렌, 테트라메틸렌, 이소부틸렌, 디메틸메틸렌, 펜타메틸렌, 헥사메틸렌, 헵타메틸렌, 옥타메틸렌, 노나메틸렌 및 데카메 틸렌) 및 방향족 탄화수소(예: 페닐메틸렌)가 포함된다. , A divalent hydrocarbon group having 3-10 carbon atoms represented by X are a straight-chain or branched hydrocarbon groups (e.g., trimethylene, isopropylene, tetramethylene, isobutylene, dimethylmethylene, pentamethylene, hexamethylene, heptamethylene, octamethylene include phenyl methylene) methylene, nona methylene and ethylene having the camera) and aromatic hydrocarbons (eg. 이중에서, 트리메틸렌, 테트라메틸렌, 펜타메틸렌, 헥사메틸렌, 헵타메틸렌, 옥타메틸렌, 노나메틸렌 및 데카메틸렌이 바람직하다. This Of these, trimethylene, tetramethylene, pentamethylene, hexamethylene, heptamethylene, octamethylene, nonamethylene and decamethylene methylene are preferred. 트리메틸렌, 헥사메틸렌, 헵타메틸렌, 옥타메틸렌, 노나메틸렌 및 데카메틸렌이 보다 바람직하다. Trimethylene, hexamethylene, heptamethylene, octamethylene, nonamethylene and decamethylene methylene is more preferable. 하이드록실 그룹을 갖는 화합물의 시안화를 수행하는 경우, 순도 및 수율의 측면에서 아크릴로니트릴 첨가로 이루어진 시아노에틸화가 우수한 방법이다. When performing a cyanide of a compound having a hydroxyl group, a cyanoethyl upset excellent method consisting of the addition of acrylonitrile in terms of purity and yield. 시아노에틸화 화합물은 탄소수 3의 2가 탄화수소 그룹을 갖는 화합물이 된다. Cyanoethylated compound is a compound in which two of the three carbon atoms having a hydrocarbon group. 이러한 관점에서, 화학식 1의 폴리옥시알킬렌 유도체는 바람직하게는 X가 탄소수 3의 2가탄화수소 그룹인 폴리옥시알킬렌 유도체이다. In this respect, the polyoxyalkylene derivative of formula (I) is preferably a polyoxyalkylene derivative X is a divalent hydrocarbon group having a carbon number of 3. 반면에, X가 탄소수 6 내지 10의 2가 탄화수소 그룹인 화학식 1의 폴리옥시알킬렌 유도체는 가수분해 안정성에 있어 우수성을 나타내므로, 생물학적 물질을 개질시켜 약제학적 제제를 개발하는 경우 품질의 동등성을 보증하는데 바람직하다. On the other hand, X is the quality of the equivalence When developing a pharmaceutical preparation by modifying the polyester, so the oxyalkylene derivatives exhibit superiority in hydrolysis stability and biological material of Formula (I) 2 C 6 -C 10 hydrocarbon group it is preferable to endorse. 약제학적 제제에 적용하는 경우, 폴리옥시알킬렌 유도체는 제제 균질성 및 생물학적 물질과의 반응성에 대한 요구를 충족시키기 위해 고순도이어야만 한다. When applied to pharmaceutical preparations, the polyoxyalkylene derivative will be a high purity to meet the demand for preparation homogeneity and reactivity with biological substances. 제제 균질성의 측면에서, 폴리옥시알킬렌 유도체는, 특히 분자량이 2배 또는 3배 등인 화합물의 함량과 관련된 크로마토그래피 순도인, 의도된 고 GPC 순도를 가져야만 한다. In terms of preparation homogeneity, the polyoxyalkylene derivative is, in particular having a molecular weight must have a chromatographic purity of, the intended high GPC purity, related to the content of the two or three times or the like compound. 본 발명에 따르는 폴리옥시알킬렌 유도체가 90% 이상, 특히 95% 이상의 GPC 순도를 갖는 것이 바람직하다. It is a polyoxyalkylene derivative according to the invention having at least 90% or more, particularly 95% GPC purity is preferred. GPC 순도는 다음 조건하에 겔 투과 크로마토그래피(GPC)에 의해 측정한다. GPC purity is measured by gel permeation chromatography (GPC) under the following conditions. 유속: 1.0㎖/분 Flow rate: 1.0㎖ / min. 피크가 분리되는 경우 정점 사이의 최소점에서 수직으로 분할한다. If the peaks are separated and divided vertically from the minimum point between peaks. 피크가 숄더(shoulder)를 갖는 경우 변곡점에서 수직으로 분할한다. If a peak has a shoulder (shoulder) is divided vertically in the inflection point. 주 피크의 면적비는 분할된 피크의 면적으로부터 계산한다. The area ratio of the main peak is calculated from the area of ​​the divided peaks. 생물학적 물질과의 충분한 반응성을 보증하기 위해, 폴리옥시알킬렌 유도체가 활성 말단 그룹인 말레이미도 그룹으로의 높은 치환도를 갖는 것이 바람직하다. In order to ensure sufficient reactivity with a biological substance, it is preferred that the poly oxyalkylene derivative having a high degree of substitution with the active end group, maleimido group. 활성 말단 그룹으로의 낮은 치환도에서, 목적하는 개질된 생물학적 물질의 생성율은 감소될 수 있으며, 이는 혈중 지속시간의 감소와 같은 제제의 성능 감소를 초래한다. Low substitution of the active end-group is also, generation rate of the object-modified biological materials which can be reduced, which results in reduced performance of the formulation, such as the reduction of blood duration. 생물학적 물질을 개질시키는데 사용되는 폴리옥시알킬렌 유도체는 90% 이상, 특히 92% 이상의, 작용성 말단 그룹인 말레이미도 그룹으로의 치환도를 갖는 것이 바람직하다. The polyoxyalkylene derivative used to modify a biological substance preferably has a degree of substitution of more than 90%, in particular more than 92%, terminal functional group, maleimido group. 말레이미도 그룹 치환도는 중수소화(deuteric) 클로로포름 0.55㎖속에 용해된 중량이 15 내지 20mg인 샘플상에서 ECP400(공급원: JEOL Ltd.)를 사용하여 400MHz에서 1 H-NMR 분석하여 측정한다. The 1 H-NMR analysis measured at 400MHz using: (JEOL Ltd. source) maleimido group substitution degree of deuteration (deuteric) ECP400 on the sample weight is from 15 to 20mg dissolved in chloroform 0.55㎖. 말레이미도 그룹에 부여된 피크(δ 6.69, s), 원료(말레아미드산-말단화된 폴리옥시알킬렌 유도체)에 부여된 피크(δ 6.35, dd) 및 반응 중간체에 부여된 피크(δ 7.22 및 6.62, d) 각각의 적분값은 NMR 스펙트럼으로부터 수득한다. The peak assigned to the peak (δ 6.35, dd), and the reaction intermediate given to - (terminated polyoxyalkylene derivative maleic amide acid) (δ 7.22 and the maleimido group of the peak (δ 6.69, s), material applied to the each of the integrated values ​​6.62, d) is obtained from the NMR spectrum. 적분값의 총계에 대한 말레이미도 그룹에 부여된 피크 면적의 백분율은 말레이미도 그룹 치환도를 의미한다. The percentage of the peak area assigned to maleimido groups to the total of the integral value means a maleimido group substitution degree. 생물학적 물질과의 반응은 통상적으로 완충 용액속에서 수행한다. Reaction with a biological substance is usually carried out in a buffer solution. 따라서, 폴리옥시알킬렌 유도체는 완충 용액 속에서 가수분해에 대한 우수한 안정성을 가져야만 한다. Thus, the polyoxyalkylene derivative must have excellent stability against hydrolysis in a buffer solution. 그렇지 않은 경우, 폴리옥시알킬렌 유도체는 완충 용액속에서 가수분해되어 생물학적 물질의 개질도가 낮아짐으로써 충분한 개질 효과를 생성할 수 없게 된다. If not, the polyoxyalkylene derivative is hydrolyzed in a buffer solution it is impossible to generate a sufficient modification effect by the modification of the biological material also becomes lower. 이러한 경우, 폴리옥시알킬렌 유도체는 충분한 개질 효과를 달성하도록 과량으로 사용되어야 한다. In this case, the polyoxyalkylene derivative is to be used in excess to achieve sufficient modification effects. 생물학적 물질을 개질시키는데 사용되는 폴리옥시알킬렌 유도체의 가수분해 안정성은 pH 7 및 23℃에서 가수분해 안정성 시험시 말레이미도 그룹 치환도의 반감기(50% 감소 시간)가 48시간 이상, 바람직하게는 54시간 이상, 보다 바람직하게는 60시간 이상이 되게하는 정도이다. Hydrolysis of the polyoxyalkylene derivative used to modify a biological substance decomposition stability is pH 7 and at 23 ℃ hydrolytic stability test when maleimido group half-life of the degree of substitution (50% reduction time) is more than 48 hours, preferably from 54 hours or more, and more preferably is about to be at least 60 hours. 폴리알킬렌 유도체가 가수분해 안정성 시험시 24시간 이상의 25% 감소 시간 및 67시간 이상의 70% 감소 시간, 바람직하게는 27시간 이상의 25% 감소 시간 및 75시간 이상의 70% 감소 시간을 갖는 것이 또한 바람직하다. Polyalkylene derivatives it is also desirable to have a hydrolytic stability test during 24 hours more than 25% reduction in time and more than 67 hours 70% reduction time, preferably at least 27 hours and 25% reduction time, and over 75 hours 70% reduction time . 가수분해 안정성 시험은 다음과 같이 수행한다. Hydrolytic stability test is performed as follows. 중량이 0.02g인 샘플 화합 물을 50㎖들이 스크류 유리병내의 50mM 인산 완충액(pH 7) 20㎖속에 용해시키고 23℃에서 정치시킨다. A weight of 0.02g of the sample compounds 50㎖ are dissolved in 50mM phosphate buffer (pH 7) 20㎖ in the screw vial then allowed to stand at 23 ℃. 용해시켜 24시간, 48시간 또는 72시간 후에 수거된 4㎖ 분취액을 몇 방울의 1% 인산 수용액과 혼합하고 동결건조시킨다. Dissolving is mixed with 1% aqueous phosphoric acid solution of 24 hours, 48 ​​hours or 72 hours a 4㎖ aliquot was collected after a few drops, and freeze-dried. 고체를 클로로포름속에 용해시키고 불용성 물질을 여과하여 제거한다. The solid was dissolved in chloroform and the insolubles were filtered off. 여과물을 진공에서 농축시켜 샘플을 제조하고, 이를 1 H-NMR로 분석하여 말레이미도 그룹 치환도를 측정한다. Concentration of the filtrate in vacuo to prepare a sample, and analyzes it by 1 H-NMR to measure the maleimido group substitution degree. 각 측정 시간에서 측정된 말레이미도 그룹 치환도를 초기 말레이미도 그룹 치환도로 나누고, 그 몫에 100을 곱하여 말레이미도 그룹의 잔류비(%)를 수득한다. A maleimido group substitution degree measured at each measurement time, the initial maleimido group substitution road divides, multiplied by 100 to the quotient to obtain a residual ratio (%) of the maleimido group. 잔류비가 75%, 50%(절반) 및 30%인 시간은 각각 25% 감소 시간, 50% 감소 시간(반감기) 및 70% 감소 시간을 의미한다. Remaining time of the ratio to 75%, and 50% (half), and 30% means 25% reduction time, 50% reduction time (half-life) and 70% reduction time. 25% 감소 시간, 50% 감소 시간(반감기) 및 70% 감소 시간은, 24시간, 48시간 및 72시간 후의 잔류비를 세로축상에, 시간을 가로축상에 좌표로 나타내어 절편이 100인 회귀선을 수득하고, 잔류비가 75%, 50% 및 30%인 시간을 회귀에 기초하여 계산함으로써 수득할 수 있다. 25% reduction time, 50% reduction time (half-life) and 70% reduction time, to give the 24 hours, 48 ​​hours and 72 hours the residual ratio of the vertical axis onto a, it exhibits a time to coordinates on the horizontal axis 100 of the regression line segment after and by calculating on the basis of the residual ratio of the time to 75%, 50% and 30% of the regression it can be obtained. 본 발명에 따르는 폴리옥시알킬렌 유도체는 화학식 3의 아미노-말단화된 폴리옥시알킬렌 유도체로부터 제조할 수 있다. The polyoxyalkylene derivative according to the invention are amino of formula (III) can be prepared from the end of the shoe polyoxyalkylene derivative. 순도의 관점에서, 당해 방법은 바람직하게는 화학식 2의 하이드록실-말단화된 폴리옥시알킬렌 유도체로 시작한다. It begins with the end of the shoe polyoxyalkylene derivative - in terms of purity, the process is preferably the hydroxyl of formula (2). 당해 방법은 하기 반응식 1로 설명된다. The method is described in the following scheme 1. 단계(A)는 알칼리 촉매하에 하이드록실-말단화된 폴리옥시알킬 유도체(2)를 시안화하고 이어서 수소화시켜 아미노-말단화된 폴리옥시알킬렌 유도체(3)을 형성하는 것으로 이루어진다. Step (A) is hydroxyl under alkaline catalyst consists in forming a terminated polyoxyalkylene derivative (3) by cyanide, followed by a hydride-terminated polyoxyalkylene derivative of 2-amino. 시안화는, 예를 들어, 아크릴로니트릴, 또는 니트릴 그룹을 함유하는 탄소수 3 내지 10의 2가 탄화 수소의 할라이드를 첨가하여 수행한다. Cyanide is, for example, carried out by acrylonitrile, nitrile or a 2 having 3-10 carbon atoms containing a group of adding a halide of the hydrocarbon. 수득되는 시아나이드 화합물을 수소화시켜 폴리옥시알킬렌 쇄와 아미노 말단 그룹 사이에 탄소수 3 내지 10의 2가 탄화수소 그룹을 갖는 화합물(3)을 수득한다. Hydrogenation of the cyanide compound to be obtained, to obtain the polyoxyalkylene chain and the amino terminus of compound (3) between the two groups having 3-10 carbon atoms having a hydrocarbon group. 시안화제로서 할라이드는 바람직하게는 브로마이드, 클로라이드 또는 요오다이드, 보다 바람직하게는 클로라이드 또는 브로마이드이다. A cyanating agent halide is preferably bromide, a chloride or iodide, more preferably chloride or bromide. 시안화는 바람직하게는 출발 화합물(2)을 용해시킬 수 있는 물 또는 유기 용매 속에서 수행한다. Cyanide is preferably carried out in water or an organic solvent capable of dissolving the starting compound (2). 적합한 유기 용매로는, 클로로포름, 톨루엔, 아세토니트릴 및 디메틸포름아미드가 포함되며, 톨루엔 및 아세토니트릴이 바람직하다. Suitable organic solvents include chloroform, toluene, and acetonitrile, and include a dimethyl formamide, toluene and acetonitrile are preferred. 용매는 화합물 (2)를 기준으로 하여 50 내지 500용적/중량%, 바람직하게는 70 내지 300용적/중량%의 양으로 사용한다. Solvent is used in an amount of the compound (2) on the basis of 50 to 500 vol / wt%, preferably 70 to 300 vol / wt%. 시안화에 사용될 수 있는 알칼리 촉매로는 강 알칼리 금속 수산화물(예: 수산화칼륨 및 수산화나트륨) 및 강 알칼리 알콜레이트(예: 나트륨 메틸레이트)가 포함된다. The alkali catalyst that can be used in the cyanide is strong alkali metal hydroxide include: (eg sodium methylate) (such as potassium hydroxide and sodium hydroxide), and alkali alcoholate steel. 촉매는 화합물(2)를 기준으로 하여, 0.5 내지 25중량%, 바람직하게는 3 내지 10중량%의 양으로 사용한다. The catalyst on the basis of the compound (2), used in an amount of 0.5 to 25% by weight, preferably from 3 to 10% by weight. 아크릴로니트릴과 같은 시안화제는 바람직하게는 화합물(2)의 하이드록실 당량당 1 내지 100당량, 특히 10 내지 60당량의 양으로 사용된다. A cyanating agent, such as acrylonitrile is preferably used in an amount of Compound (2) from 1 to 100 hydroxyl equivalent weight per equivalent weight, especially 10 to 60 equivalents of. 시안화 반응은 바람직하게는 -20℃ 내지 150℃, 특히 0 내지 100℃의 온도에서 1시간 내지 10시간, 특히 2시간 내지 6시간 동안 수행한다. Cyanation reaction is preferably carried out for -20 ℃ to 150 ℃, in particular from 0 to 1 hour to 10 hours at a temperature of 100 ℃, preferably 2 hours to 6 hours. 반응 후, 촉매를 물로 세척하거나 흡착 처리하여 제거하고, 용매를 제거하여 폴리옥시알킬렌 시아나이드를 수득한다. After the reaction, washing the catalyst with water or removed by adsorption treatment, and the solvent was removed to give a polyoxyalkylene cyanide. 이어서, 수득되는 시아나이드 화합물을 통상적으로 수소화용으로 사용되는 촉매의 존재하에 수소화시켜 아미노-말단화된 폴리옥시알킬렌 유도체(3)를 수득한다. 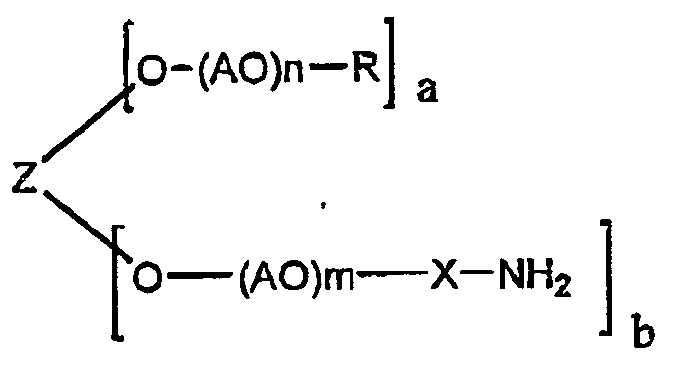 Then, amino by hydrogenation in the presence of a catalyst used for the hydrogenation of the cyanide compound to be obtained in a conventional - to obtain a terminated polyoxyalkylene derivative (3). 수소화 반응은 바람직하게는 시아나이드를 용해시킬 수 있는 유기 용매(예: 톨루엔 또는 에탄올)속에서 수행한다. The hydrogenation reaction is preferably an organic solvent capable of dissolving the cyanide: is carried out in a (for example, toluene or ethanol). 톨루엔이 특히 바람직하다. Toluene is especially preferred. 용매는 폴리옥시알킬렌 시아나이드를 기준으로 하여, 50 내지 500용적/중량%, 바람직하게는 70 내지 300용적/중량%의 양으로 사용한다. Solvents include polyoxyalkylene based on the cyanide, is used in an amount of 50 to 500 vol / wt%, preferably 70 to 300 vol / wt%. 수소화에 적합한 촉매로는 니켈 및 코발트가 포함되며, 니켈이 바람직하다. Suitable catalysts for the hydrogenation is contained the nickel and cobalt, with nickel being preferred. 촉매는 바람직하게는 폴리옥시알킬렌 시아나이드를 기준으로 하여, 0.5 내지 25중량%, 특히 1 내지 10중량%의 양으로 사용된다. The catalyst preferably polyoxyethylene and alkyl relative to the alkylene cyanide, is used in an amount of 0.5 to 25% by weight, especially 1 to 10% by weight. 니켈 촉매를 사용하는 경우, 암모니아 가스를 첨가하여 수소화 동안 부반응을 방지하는 것이 바람직하다. When using a nickel catalyst, it is preferred that by the addition of ammonia gas to prevent side reaction during hydrogenation. 암모니아 가스는 바람직하게는 폴리옥시알킬렌 시아나이드를 기준으로 하여, 5 내지 30중량%, 특히 10 내지 20중량%의 양으로 첨가한다. Ammonia gas is preferably a polyoxyalkylene based on the alkylene cyanide, it is added in an amount of 5 to 30% by weight, in particular 10 to 20% by weight. 수소화 반응은 바람직하게는 1 내지 10MPa, 특히 3 내지 6MPa의 수소압에서 80 내지 200℃, 특히 100 내지 150℃에서 0.5 내지 10시간, 특히 1 내지 5시간 동안 수행한다. Hydrogenation reaction is carried out preferably from 1 to 10MPa, in particular for 3 to 80 to 200 ℃ at a hydrogen pressure of 6MPa, in particular from 100 to 150 ℃ 0.5 to 10 hours, particularly 1 to 5 hours. 반응 후, 촉매를 여과하여 제거하고, 용매를 제거하여 아미노-말단화된 폴리옥시알킬렌 유도체(3)를 수득한다. After the reaction was filtered to remove the catalyst and removal of the solvent amino-end to give the polyoxyalkylene derivative shoe (3). 경우에 따라, 단계(A)에서 제조된 폴리옥시알킬렌 시아나이드 및 화합물(3)은 결정화 또는 흡착 등의 과정에 의해 정제될 수 있다. If desired, the polyoxyalkylene cyanide and the compound (3) prepared in step (A) can be purified by a procedure such as crystallization or adsorption. 단계(B)는 단계(A)에서 제조된 화합물(3)을 말레산 무수물과 반응시켜 화학식 4의 말레아미드산-말단화된 폴리옥시알킬렌을 수득하는 것으로 이루어진다. Step (B) is reacted with the compound (3) of maleic anhydride produced in step (A) maleic acid amide of the formula (4) - it consists in the end of the shoe to give the polyoxyalkylene. 아미노-말단화된 폴리옥시알킬렌 유도체(3)의 아민 순도는 바람직하게는 90% 이상, 보다 바람직하게는 95% 이상이다. The amino-end of the amine purity of the shoe polyoxyalkylene derivative (3) is preferably not less than 90%, more preferably 95% or more. 아민 순도가 낮은 경우, 단계(C)에서 결정화가 실질적으로 발생하지 않으므로 최종 생성물인, 화학식(1)의 폴리옥시알킬렌 유도체의 말레이미도 그룹 치환도가 낮아진다. If the amine purity is low, because crystallization does not occur substantially in a step (C) is lowered in the end product, maleimido group substitution degree of the polyoxyalkylene derivative of formula (1). 아민 순도는 다음 조건하에 액체 크로마토그래피시켜 측정할 수 있다. Amine purity can be determined by liquid chromatography under the following conditions. 유속: 0.5㎖/분 Flow rate: 0.5㎖ / min. 피크가 분리되는 경우, 정점 사이의 최소점에서 수직으로 분할한다. If a peak is separated, it is divided vertically at a minimum point between peaks. 피크가 숄더(shoulder)를 갖는 경우, 변곡점에서 수직으로 분할한다. If a peak has a shoulder (shoulder), it is divided vertically at the inflection point. 주 피크의 면적비는 분할된 피크의 면적으로부터 계산한다. The area ratio of the main peak is calculated from the area of ​​the divided peaks. 반응을 수행하는 경우, 화합물(3)은 바람직하게는 화합물(3)을 용해시킬 수 있는 유기 용매, 바람직하게는 클로로포름 또는 톨루엔 속에 용해시킨다. When carrying out the reaction, the compound (3) is thereby preferably a compound (3) can dissolve soluble organic solvent, preferably in chloroform or toluene in the. 용매는 바람직하게는 화합물(3)을 기준으로 하여, 50 내지 500용적/중량%, 바람직하게는 70 내지 300용적/중량%의 양으로 사용한다. Solvent is preferably used in an amount of the compound (3) on the basis of 50 to 500 vol / wt%, preferably 70 to 300 vol / wt%. 말레산 무수물은 바람직하게는 화합물(3)의 아미노 당량당 1.0 내지 20당량, 특히 5 내지 15당량의 양으로 사용한다. Maleic anhydride is preferably used in an amount of 1.0 to 20 equivalents per equivalent of amino compound (3), in particular from 5 to 15 equivalents. 반응 온도는 바람직하게는 20 내지 80℃, 보다 바람직하게는 40 내지 60℃이다. The reaction temperature is preferably more preferably from 20 to 80 ℃, from 40 to 60 ℃. 반응 시간은 바람직하게는 0.5 내지 10시간, 특히 1시간 내지 5시간이다. The reaction time is preferably 0.5 to 10 hours, particularly from 1 hour to 5 hours. 수득되는 말레아미드산 말단화된 폴리옥시알킬렌 유도체(4)를 화합물(4)를 용해시킬 수 있는 유기 용매 속에 용해시키고 에틸 아세테이트와 n-헥산의 혼합물을 사용하여 결정화시킨다. Dissolving the maleic acid amide horse shoe obtained polyoxyalkylene derivative (4) in an organic solvent capable of dissolving the compound (4) and is crystallized using a mixture of ethyl acetate and n- hexane. 화합물(4)을 위한 유기 용매로는 바람직하게는 클로로포름, 톨루엔, 아세토니트릴 및 디메틸포름아미드가 포함되며, 클로로포름 및 톨루엔이 특히 바람직하다. With an organic solvent for compound (4) is preferably chloroform, toluene, acetonitrile and dimethylformamide, chloroform and toluene are particularly preferred. 유기 용매는 화합물(4)를 기준으로 하여, 50 내지 500용적/중량%, 바람직하게는 70 내지 300용적/중량%의 양으로 사용한다. Organic solvents, based on the compound (4), 50 to 500 vol /% by weight is preferably used in an amount of 70 to 300 vol / wt%. 에틸 아세테이트/n-헥산이 혼합된 용매를 화합물(4)를 기준으로 하여, 300 내지 5000용적/중량%, 바람직하게는 500 내지 2000용적/중량%의 양으로 사용한다. Ethyl acetate / n- hexane to the mixed solvent based on the compound (4), the 300 to 5000 vol / wt%, preferably from 500 to 2000 vol / used in an amount in wt%. 에틸 아세테이트 대 n-헥산의 혼합 비는 용적을 기준으로 하여, 1:9 내지 9:1, 바람직하게는 4:6 내지 6:4이다. Mixing ratio of ethyl acetate-hexane for n- is based on the volume, 1: 4: 9 to 9: 1, preferably 4: 6 to 6. 결정화 단계에서, 화합물(4)가 유기 용매로 용해되는 온도는 바람직하게는 0 내지 80℃, 보다 바람직하게는 20 내지 40℃이다. In the crystallization step, the temperature at which the compound 4 is dissolved in an organic solvent is preferably from preferably from 20 to 40 ℃ than 0 to 80 ℃,. 결정화시키기 위해, 화합물(4)가 유기 용매속에 용해된 당해 용액에 에틸 아세테이트/n-헥산 혼합물을 첨가하는 온도는 바람직하게는 20 내지 35℃이다. To crystallize, the temperature at which compound (4) is added to the solution of ethyl acetate / n- hexane to the mixture dissolved in an organic solvent is preferably from 20 to 35 ℃. 에틸 아세테이트 및 n-헥산을 개별적으로 첨가할 수 있다. The ethyl acetate and n- hexane may be added separately. 결정화는 반복해서 수행할 수 있다. Crystallization may be carried out repeatedly. 수득되는 말레아미드산-말단화된 폴리옥시알킬렌 유도체(4)가 0.5중량% 이하, 특히 0.1중량% 이하의 말레산 무수물 함량을 갖는 것이 바람직하다. To give a maleic acid amide - a-terminated polyoxyalkylene derivative (4) preferably has a maleic anhydride content of up to 0.5 wt.%, Particularly 0.1% by weight. 화합물(4)중의 높은 말레산 무수물 함량은, 의도한 분자량보다 분자량이 높은 불순물을 형성시킬 수 있으며, 이는 GPC 순도를 감소시킬 수 있다. Compound high maleic anhydride content in the (4), it is possible to form a high molecular weight impurities than an intended molecular weight, which can be reduced GPC purity. 말레산 무수물 함량은 중수소화 클로로포름 0.55㎖중의 샘플 화합물 15 내지 20mg의 용액상에서 ECP400(공급원: JEOL Ltd.)를 사용하여 400MHz에서 1 H-NMR 분석으로 측정한다. Maleic anhydride content was ECP400 on the sample a solution of from 15 to 20mg of deuterated chloroform 0.55㎖: determined by 1 H-NMR analysis at 400MHz using (source JEOL Ltd.). 기준 피크(예를 들어, 기준으로서 메톡시 그룹에 부여된 피크: δ 3.38, s, 3H)와 비교하여 수득된 NMR 스펙트럼으로부터 말레산 무수물에 부여된 피크의 적분값(δ 7.05, s, 2H)을 수득하고, 이로부터 말레산 무수물 함량을 다음의 수학식 1에 따라 계산한다. Standard peak (for example, a peak assigned as a reference to a methoxy group: δ 3.38, s, 3H), and the integral of the peak assigned to maleic anhydride from the NMR spectra (δ 7.05, s, 2H) obtained in comparison the yield, and the maleic anhydride content is calculated therefrom according to the following equation (1). 단계(C)는 화합물(4)의 말단 말레아미드산을 폐환(이미드화)시켜 폴리옥시알킬렌 유도체(1)를 수득하는 것으로 이루어진다. Step (C) is ring-closed to the terminal maleic acid amide of the compound (4) consists in to give (imidized), to give a polyoxyalkylene derivative (1). 폐환 반응은 화합물(4)를 기준으로 하여 아세트산 무수물 5 내지 1000중량%, 바람직하게는 100 내지 500중량% 속에 화합물(4)를 용해시키고, 이에 화합물 4를 기준으로 하여, 촉매(예: 나트륨 아세테이트 또는 트리에틸아민) 1 내지 50중량%, 바람직하게는 5 내지 40중량%를 첨가하고, 반응계를 60 내지 130℃에서 가열함으로써 수행한다. Cyclization is the basis of the compound (4) was dissolved the compound (4) in 5 to 1000% by weight of acetic anhydride, preferably 100 to 500% by weight, whereby the compound 4 as a reference, a catalyst (e.g., sodium acetate or tri ethyl amine was added) 1 to 50% by weight, preferably 5 to 40% by weight, and carried out by heating the reaction system at 60 to 130 ℃. 경우에 따라, 유기 용매를 사용할 수 있다. In some cases, it is possible to use an organic solvent. 유용한 유기 용매로는 클로로포름, 아세토니트릴 및 톨루엔이 포함된다. Useful organic solvents include chloroform, acetonitrile and toluene. 유기 용매는 화합물(4)를 기준으로 하여, 50 내지 500용적/중량%, 바람직하게는 70 내지 300용적/중량%의 양으로 사용한다. Organic solvents, based on the compound (4), 50 to 500 vol /% by weight is preferably used in an amount of 70 to 300 vol / wt%. 반응 후, 촉매를 여과하여 제거하고, 여과물을 감압하에 60 내지 130℃에서 농축시킨다. After the reaction, the catalyst is removed by filtration and the filtrate was concentrated at 60 to 130 ℃ under reduced pressure. 농축물은 유기 용매속에 용해시키고 에틸 아세테이트/n-헥산 혼합물 을 당해 용액에 첨가하여 결정화시킨다. The concentrate is crystallized by dissolving the art and added to the ethyl acetate / n- hexane mixture solution in an organic solvent. 결정을 여과하여 수집하고 건조시켜 목적하는 화합물(1)을 수득한다. To obtain a compound (1) of interest it was collected by filtration and the crystals were dried. 유기 용매로는 바람직하게는 클로로포름 및 톨루엔이 포함된다. With an organic solvent is preferably chloroform, and toluene. 유기 용매는 화합물(1)을 기준으로 하여, 50 내지 500용적/중량%, 바람직하게는 70 내지 300용적/중량%의 양으로 사용한다. Organic solvents, based on the compound (1), 50 to 500 vol /% by weight is preferably used in an amount of 70 to 300 vol / wt%. 에틸 아세테이트/n-헥산이 혼합된 용매는 화합물(1)을 기준으로 하여, 300 내지 5000용적/중량%, 바람직하게는 500 내지 2000용적/중량%의 양으로 사용한다. Ethyl acetate / n- hexane mixed solvent based on the compound (1), 300 to 5000 vol / wt%, preferably used in an amount of from 500 to 2000 vol / wt%. 에틸 아세테이트 대 n-헥산의 혼합비는 용적을 기준으로 하여, 1:9 내지 9:1, 바람직하게는 4:6 내지 6:4이다. The mixing ratio of ethyl acetate-hexane for n- is based on the volume, 1: 4: 9 to 9: 1, preferably 4: 6 to 6. 에틸 아세테이트 및 n-헥산은 개별적으로 첨가할 수 있다. Ethyl acetate and n- hexane may be added separately. 결정화는 반복하여 수행할 수 있다. Crystallization may be carried out repeatedly. 본 발명의 폴리옥시알킬렌 유도체를 사용한 생물학적 물질의 개질은 다음 방법으로 달성될 수 있다. Modification of a biological substance with the polyoxyalkylene derivative of the present invention can be achieved in the following ways: 예를 들어, 생물학적 물질을 인산 완충액속에 용해시키고 10℃ 이하로 냉각시킨다. For example, a biological substance is dissolved in phosphate buffer is cooled to below 10 ℃. 말레이미도-말단화된 폴리옥시알킬렌 유도체를 냉각된 용액에 첨가한 다음, 1시간 내지 10시간 동안 교반한다. Maleimido-end and stirred was added to the cooled shoes a polyoxyalkylene derivative solution, for 1 hour to 10 hours. 반응계를 탈염시키고 동결건조시켜 폴리알킬렌 유도체-개질된 생물학적 물질을 수득한다. By desalting the reaction system and lyophilized polyalkylene derivative to obtain a modified biological material. 본 발명의 폴리옥시알킬렌 유도체는 고순도이며 이의 말레이미도 잔기의 안정성으로 인해 저장 안정성이 우수하다. The polyoxyalkylene derivative of the present invention is excellent in storage stability due to the stability of the high-purity and its maleimido moiety. 따라서, 이를 사용하여 생물학적 물질을 개질하는 경우, 수득되는 폴리옥시알킬렌 유도체-개질된 생물학적 물질도 우수한 안정성을 나타낸다. Accordingly, when the modified biological materials, using this, the polyoxyalkylene derivative obtained - shows excellent stability of the modified biological materials. 본 발명에 따르는 방법은 안정성을 갖는 목적하는 고순도 폴리옥시알킬렌 유도체를 산출한다. The process according to the invention produces the desired high purity polyoxyalkylene derivative with safety. 생물학적 물질이 본 발명의 폴리옥시알킬렌 유도체를 사용하여 개질된 개질 물질은 안정성이 우수하며 유용하다. Using the polyoxyalkylene derivative of a biological substance present invention the modified modified materials is useful and excellent in stability. 본 발명은 하기 실시예를 참조로 하여 보다 상세히 설명할 것이다. The present invention will be described in more detail with reference to the following examples. 교반기, 적하 깔때기, 온도계 및 질소-버블링 시험관이 장착된 3ℓ들이 4목 플라스크내에, n+m이 112이고 a가 1이며 b가 1인 화학식 2의 메톡시폴리옥시에틸렌(MEH-50H, 공급원: NOF Corp.) 640g을 넣고 이온 교환된 물 640g을 첨가하여 당해 화합물을 용해시킨다. A stirrer, a dropping funnel, a thermometer and a nitrogen-in bubbling test tube equipped with a 3ℓ flask four-necked, n + m is 112 and a is 1, and methoxy polyoxyethylene (MEH-50H, the source of the formula (2) b is 1, : NOF Corp.) to put the ion exchange water 640g was added to 640g is dissolved in the compound. 용액을 10℃ 이하로 냉각시키고, 50% 수산화칼륨 40g을 상기 용액에 첨가한다. The solution is cooled to below 10 ℃, a 50% potassium hydroxide 40g is added to the solution. 용액을 추가로 5℃ 이하로 냉각시키고, 아크릴로니트릴 340g을 2시간에 걸쳐 상기 용액에 적가하면서 액체 온도를 5℃ 이하로 유지시킨다. Over 340g added as a solution and cooled to below 5 ℃ of acrylonitrile was dropwise added over 2 hours to the solution and maintain the solution temperature below 5 ℃. 첨가 후, 추가로 2시간 동안 지속적으로 교반한다. And added continuously to the stirred for 2 hours after addition. 반응을 종결시킨 후, 반응 혼합물은 85% 인산 24g으로 중화시킨다. After completion of the reaction, the reaction mixture is neutralized with 85% phosphoric acid 24g. 반응 혼합물 842g에 이온 교환된 물 2800g중의 염화나트륨 500g의 용액을 첨가하고, 혼합물을 클로로포름 1000㎖로 추출한다. A solution of sodium chloride in ion-exchanged water to 2800g 842g 500g reaction mixture, and the mixture was extracted with chloroform 1000㎖. 클로로포름 층을 분리하고, 수성 층을 클로로포름 500㎖으로 다시 추출한다. The chloroform layer was separated, and the aqueous layer extracted again with chloroform 500㎖. 합한 클로로포름 추출물을 여과하고, 0.3kPa의 감압하에 90℃에서 용매를 제거하여 조 시아노에틸화 메톡시폴리옥시에틸렌 640g을 수득한다. The combined chloroform extracts were filtered and the solvent removed under reduced pressure at 90 ℃ of 0.3kPa to afford crude cyanoethylated methoxy polyoxyethylene 640g. 교반기 및 질소 밀봉 시험관이 장착된 10ℓ들이 비이커내에, 조 시아노에틸화 메톡시폴리옥시에틸렌 600g을 넣고 클로로포름 500㎖속에 용해시킨다. In a sealed tube equipped with a stirrer and a nitrogen 10ℓ to a beaker, crude cyanoethylated methoxy poly insert an oxyethylene 600g is dissolved in chloroform 500㎖. 에틸 아세테이트 4ℓ와 n-헥산 4ℓ의 혼합물을 당해 용액속에 부은 다음, 30분 동안 교반하여 결정화시킨다. Then ethyl acetate and n- hexane 4ℓ crystallized by stirring poured into a mixture of 4ℓ art solution, for 30 minutes. 결정을 여과하여 수집한다. Collect by filtration the crystals. 클로로포름 400㎖ 및 또 다른 에 틸 아세테이트(4ℓ)와 n-헥산(4ℓ)의 혼합물을 사용하여 결정화를 반복한다. Chloroform using a mixture of the 400㎖ and further ethyl acetate (4ℓ) and n- hexane (4ℓ) to repeat the crystallization. 수득되는 결정을 건조시켜 시아노에틸화 메톡시폴리옥시에틸렌 540g을 수득한다. Drying the crystals obtained to afford cyanoethylated methoxy polyoxyethylene 540g. 교반기, 온도계, 질소 도입 시험관, 수소 도입 시험관 및 암모니아 도입 시험관이 장착된 1ℓ들이 오토클레이브내에, 시아노에틸화 메톡시폴리옥시에틸렌 200g, 톨루엔 400g 및 니켈 촉매 4g을 놓는다. A stirrer, a thermometer, in the mounted 1ℓ autoclave were introduced into a test tube, test tube, hydrogen and ammonia introduced into the test tube introduced nitrogen, cyanoethylated methoxy polyoxyethylene 200g, 400g toluene and release the nickel catalyst 4g. 오토클레이브를 질소로 세정한 후, 혼합물을 60℃로 가열하여 당해 화합물을 용해시킨다. After washing the autoclave with nitrogen, the mixture was heated to 60 ℃ dissolved the compound. 당해 용액속에 암모니아 가스 30g을 도입한 다음, 수소 가스를 4MPa까지 도입한다. The art for the introduction of ammonia gas into the solution, 30g, and then introducing hydrogen gas up to 4MPa. 오토클레이브의 온도를 130℃로 상승시키고, 혼합물을 3시간 동안 교반한다. Raising the temperature of autoclave to 130 ℃, and the mixture was stirred for 3 hours. 오토클레이브 후, 80℃로 냉각시키고 촉매를 여과하여 제거하고, 여과물로부터 0.3kPa의 감압하에 90℃에서 1시간 동안 용매를 제거하여 메톡시폴리옥시에틸렌 프로필아민 170g을 수득하며, 이의 아민 순도는 95.2%인 것으로 밝혀졌다. After autoclave, and cooled to 80 ℃ and filtered to remove the catalyst and filtered to remove the solvent for 1 hour at 90 ℃ under a reduced pressure of 0.3kPa from water to give the methoxy polyoxyethylene propylamine 170g, its amine purity It was found to be 95.2%. 교반기, 온도계, 콘덴서 및 질소-버블링 시험관이 장착된 1ℓ들이 4목 플라스크내로, 메톡시폴리에틸렌 프로필아민 164g 및 톨루엔 325㎖을 충전시키고 50℃로 가열하여 용액을 제조한다. A stirrer, a thermometer, a condenser and a nitrogen-filled into the bubbling test tube equipped with a 1ℓ four-necked flask, methoxy polyethylene propylamine 164g 325㎖ and toluene was heated to 50 ℃ to prepare a solution. 당해 용액에 말레산 무수물 32g을 첨가한 다음, 4시간 동안 교반한다. By the addition of 32g maleic anhydride in the solution is stirred for 4 hours. 반응 혼합물을 40℃로 냉각시키고, 에틸 아세테이트 800㎖와 헥산 800㎖의 혼합물을 상기 반응 혼합물에 부은 다음, 30분 동안 교반하여 결정화시킨다. The reaction mixture is stirred for crystallization was cooled to 40 ℃, and then, 30 minutes poured into a mixture of ethyl acetate and hexane 800㎖ 800㎖ to the reaction mixture. 여과하여 수집된 결정을 다시 톨루엔 325㎖ 속에 용해시키고, 에틸 아세테이트 800㎖와 헥산 800㎖의 혼합물을 상기 톨루엔에 부은 다음, 30분 동안 교반하여 결정화시킨다. Filtered and the collected crystals are dissolved again in toluene 325㎖, to crystallize the mixture of ethyl acetate and hexane 800㎖ 800㎖ and stirred for, 30 minutes swelling in the toluene. 여과하여 수집된 결정을 건조시켜 메톡시폴리옥시에틸렌 프로필말레아미드산 167g을 수득하며, 이의 말레산 무수물 함량은 0.0011중량%인 것으로 밝혀졌다. Filtered and dried to collect the crystal methoxy polyoxy ethylene to afford propyl maleic acid amide 167g, maleic anhydride content thereof was found to be 0.0011% by weight. 교반기, 온도계, 콘덴서 및 질소 버블링 시험관이 장착된 1ℓ들이 4목 플라스크내로, 수득된 메톡시폴리옥시에틸렌 프로필말레아미드산 167g, 아세트산 무수물 500㎖ 및 나트륨 아세테이트 64g을 충전시킨다. Is filled with a stirrer, a thermometer, a condenser and a nitrogen gas was bubbled a test tube equipped with a ring are 1ℓ, obtained into the flask four-necked methoxy polyoxyethylene propyl maleic acid amide 167g, 64g of sodium acetate and acetic anhydride 500㎖. 혼합물을 90℃로 가열하고, 3시간 동안 교반하여 반응을 수행한다. The mixture is heated to 90 ℃, and performs the reaction to stir for 3 hours. 50℃로 냉각시킨 후, 반응 혼합물을 여과하여 나트륨 아세테이트를 제거하고 여과물을 0.3kPa의 감압하에 90℃에서 농축시킨다. After cooling to 50 ℃, then the reaction mixture was filtered to remove sodium acetate and concentrated in 90 ℃ the filtrate under a reduced pressure of 0.3kPa. 농축물을 클로로포름 330㎖ 속에 용해시키고, 임의 불용성 물질을 여과하여 제거한다. Chloroform 330㎖ dissolved in the concentrate and is removed by filtration any insoluble material. 에틸 아세테이트 1ℓ와 헥산 1ℓ의 혼합물을 여과물에 부은 다음, 30분 동안 교반하여 결정화시킨다. A mixture of ethyl acetate and hexane 1ℓ 1ℓ filtered crystallize with stirring and then poured into water, for 30 minutes. 결정을 여과하여 수집한다. Collect by filtration the crystals. 결정을 다시 클로로포름 330㎖ 속에 용해시키고, 30분 동안 교반하여 또 다른 에틸 아세테이트(1ℓ)와 헥산(1ℓ)의 혼합물로부터 결정화시킨다. It was dissolved in chloroform to determine 330㎖ again and stirred for 30 minutes to crystallize from a mixture of other ethyl acetate (1ℓ) and hexane (1ℓ). 여과하여 수집된 결정을 건조시켜 연분홍색의 메톡시 폴리옥시에틸렌 프로필말레이미드 160g을 수득한다. Drying the crystals collected by filtration to give the methoxy polyoxyethylene propyl maleimide 160g of light pink. 교반기, 적하 깔때기, 온도계 및 질소 버블링 시험관이 장착된 5ℓ들이 4목 플라스크내에, a가 0이고, m이 113이며, b가 2인 화학식 2의 폴리에틸렌 글리콜(PEG 11000, 공급원: NOF Corp., 분자량: 10000) 1600g를 넣고, 이온 교환된 물 1600g을 첨가하여 당해 화합물을 용해시킨다. In a stirrer, a dropping funnel, a thermometer and a nitrogen bubbling test tube equipped with a four-necked 5ℓ flask, a is 0, m is 113, b is 2, polyethylene glycol (PEG 11000, the source of the formula 2: NOF Corp., molecular weight: 10000) was added to 1600g, it was added to the ion exchange water 1600g was dissolved the compound. 용액을 10℃ 이하로 냉각시키고 50% 수산화칼륨 100g을 상기 용액에 첨가한다. The solution was cooled to below 10 ℃ was added to 100g of 50% potassium hydroxide to the solution. 용액을 추가로 5℃ 이하로 냉각시키고 아크릴로니트릴 850g을 2시간에 걸쳐 상기 용액에 적가하면서 액체 온도를 5℃ 이하로 유지시킨다. Over a further 850g of the solution was cooled to below 5 ℃ acrylonitrile was dropwise added over 2 hours to the solution and maintain the solution temperature below 5 ℃. 첨가 후, 추가로 2시간 동안 지속적으로 교반한다. And added continuously to the stirred for 2 hours after addition. 반응을 종결시킨 후, 반응 혼합물을 85% 인산 60g을 첨가하여 중화시킨다. After completion of the reaction, the reaction mixture was neutralized by addition of 85% phosphoric acid 60g. 이온 교환된 물 7000g중의 염화나트륨 1250g의 용액, 클로로포름 2500㎖ 및 클로로포름 1250㎖을 사용하여 실시예 1과 동일한 방식으로 반응 혼합물을 후처리하여 조 디시아노에틸화 폴리옥시에틸렌 1600g을 수득한다. And ion exchange water 7000g The reaction mixture in the same manner as in Example 1 using the solution, chloroform and chloroform 2500㎖ 1250㎖ of 1250g of sodium chloride, treated to afford crude dicyano ethylated polyoxyethylene 1600g. 교반기 및 질소 밀봉 시험관이 장착된 30ℓ들이 비이커내에, 조 디시아노에틸화 폴리옥시에틸렌(1600g)을 넣고 클로로포름 1.4ℓ속에 용해시킨다. In a sealed tube equipped with a stirrer and a nitrogen 30ℓ to a beaker, into the crude dicyano ethylated polyoxyethylene (1600g) was dissolved in chloroform and 1.4ℓ. 에틸 아세테이트 11.1ℓ와 헥산 11.1ℓ의 혼합물을 당해 용액에 부은 다음, 30분 동안 교반하여 결정화시킨다. It is crystallized with ethyl acetate-hexane and stirred 11.1ℓ 11.1ℓ for mixture, and then, 30 minutes poured into a solution of the art. 결정을 여과하여 수집한다. Collect by filtration the crystals. 결정을 다시 클로로포름 1.4ℓ속에 용해시키고, 또 다른 에틸 아세테이트(11.1ℓ)와 n-헥산(11.1ℓ)의 혼합물을 상기 클로로포름에 부은 다음, 교반한다. Was dissolved in chloroform again determined 1.4ℓ, the mixture is poured again in the other ethyl acetate (11.1ℓ) and n- hexane (11.1ℓ) to the chloroform, followed by agitation. 앞서 침전된 결정을 여과하여 수집하고 건조시켜 디시아노에틸화 폴리옥시에틸렌 1400g을 수득한다. And filtering the precipitated crystals previously collected and dried to give the dicyano ethylated polyoxyethylene 1400g. 교반기, 온도계, 질소 도입 시험관, 수소 도입 시험관 및 암모니아 도입 시험관이 장착된 1ℓ들이 오토클레이브내에, 디시아노에틸화 폴리옥시에틸렌 200g, 톨루엔 400g 및 니켈 촉매 9g을 넣는다. Add a stirrer, a thermometer, a nitrogen inlet tube, are in a 1ℓ autoclave, the hydrogen is introduced into the test tube and ammonia introduced into a test tube equipped, dicyano ethylated polyoxyethylene 200g, 400g of toluene and 9g of a nickel catalyst. 혼합물을 반응시키고 실시예 1과 동일한 방식으로 후처리하여 폴리옥시에틸렌 디프로필아민 170g을 수득하며, 이의 아민 순도는 93.7%인 것으로 밝혀졌다. The reaction mixture was post-treated in the same manner as in Example 1 to afford polyoxyethylene di-propylamine 170g, amine purity thereof was found to be 93.7%. 교반기, 온도계, 콘덴서 및 질소-버블링 시험관이 장착된 1ℓ들이 4목 플라스크내로, 폴리옥시에틸렌 디프로필아민 164g 및 톨루엔 325㎖을 충전시키고 50℃로 가열하여 용액을 제조한다. A stirrer, a thermometer, a condenser and a nitrogen-bubbling to a test tube equipped with 1ℓ to charge the polyoxyethylene dipropylamine and 164g toluene 325㎖ into the four-neck flask and heated to 50 ℃ to prepare a solution. 당해 용액에 말레산 무수물 32g을 첨가한 다음, 4시간 동안 교반한다. By the addition of 32g maleic anhydride in the solution is stirred for 4 hours. 반응 혼합물을 40℃로 냉각시키고 에틸 아세테이트 800㎖와 헥산 800㎖의 혼합물을 상기 반응 혼합물에 부은 다음, 30분 동안 교반하여 결정화시킨다. The reaction mixture was cooled to 40 ℃ was poured a mixture of ethyl acetate and hexane 800㎖ 800㎖ to the reaction mixture and then crystallized by stirring for 30 minutes. 여과하여 수집된 결정을 톨루엔 325㎖ 속에 다시 용해시키고, 에틸 아세테이트 800㎖와 헥산 800㎖의 혼합물을 상기 톨루엔에 부은 다음, 30분 동안 교반하여 결정화시킨다. The crystal was collected by filtration and re-dissolved in toluene 325㎖, to crystallize the mixture of ethyl acetate and hexane 800㎖ 800㎖ and stirred for, 30 minutes swelling in the toluene. 여과하여 수집된 결정을 건조시켜 폴리옥시에틸렌 디프로필말레아미드산 165g을 수득하며, 이의 말레산 무수물 함량은 0.0018중량%인 것으로 밝혀졌다. Drying the crystals collected by filtration and polyoxyethylene dipropylamine to give the maleic acid amide 165g, maleic anhydride content thereof was found to be 0.0018% by weight. 교반기, 온도계, 콘덴서 및 질소 버블링 시험관이 장착된 1ℓ들이 4목 플라스크내로, 수득된 폴리옥시에틸렌 디프로필말레아미드산 165g, 아세트산 무수물 500㎖ 및 나트륨 아세테이트 63g을 충전시킨다. 1ℓ a stirrer, a thermometer, a condenser and a nitrogen-bubbling test tube attached to and filled into a four-neck flask, the resultant polyoxyethylene dipropyl amide maleic acid 165g, 63g of sodium acetate and acetic anhydride 500㎖. 혼합물을 90℃로 가열하고, 이 온도에서 3시간 동안 교반하여 반응을 수행한다. The mixture is heated to 90 ℃, and performs the reaction to stir for 3 hours at this temperature. 50℃로 냉각시킨 후, 반응 혼합물을 여과하여 나트륨 아세테이트를 제거하고 여과물을 0.3kPa의 감압하에 90℃에서 농축시킨다. After cooling to 50 ℃, then the reaction mixture was filtered to remove sodium acetate and concentrated in 90 ℃ the filtrate under a reduced pressure of 0.3kPa. 농축물을 클로로포름 360㎖ 속에 용해시키고, 임의 불용성 물질을 여과하여 제거한다. Chloroform 360㎖ dissolved in the concentrate and is removed by filtration any insoluble material. 에틸 아세테이트 1ℓ와 헥산 1ℓ의 혼합물을 여과물에 부은 다음, 30분 동안 교반하여 결정화시킨다. A mixture of ethyl acetate and hexane 1ℓ 1ℓ filtered crystallize with stirring and then poured into water, for 30 minutes. 결정을 여과하여 수집한다. Collect by filtration the crystals. 결정을 클로 로포름 360㎖ 속에 다시 용해시키고, 30분 동안 교반하여 또 다른 에틸 아세테이트(1ℓ)와 헥산(1ℓ)의 혼합물로부터 결정화시킨다. By re-dissolved in formic 360㎖ the decided chloride and stirred for 30 minutes to crystallize from a mixture of other ethyl acetate (1ℓ) and hexane (1ℓ). 여과하여 수집된 결정을 건조시켜 연분홍색 폴리옥시에틸렌 디프로필말레이미드 160g을 수득한다. Drying the crystals collected by filtration to give a pale pink polyoxyethylene dipropyl maleimide 160g. 교반기, 적하 깔때기, 온도계 및 질소-버블링 시험관이 장착된 5ℓ들이 4목 플라스크내에, a가 0이고 m이 56이며 b가 4인 테트라(폴리옥시에틸렌) 디글리세롤 에테르(DEG-10000, 공급원: NOF Corp., 분자량: 10000)을 넣고 이온 교환된 물 1600g을 첨가하여 당해 화합물을 용해시킨다. A stirrer, a dropping funnel, a thermometer and a nitrogen-in bubbling test tube equipped with a 5ℓ flask four-neck, a is zero and m is 56 and the tetrahydro b 4 (polyoxyethylene) diglycerol ether (DEG-10000, source: NOF Corp., molecular weight: put 000) by the addition of ion-exchange water 1600g was dissolved the compound. 용액을 10℃ 이하로 냉각시키고 50% 수산화칼륨 100g을 상기 용액에 첨가한다. The solution was cooled to below 10 ℃ was added to 100g of 50% potassium hydroxide to the solution. 용액을 5℃ 이하로 추가로 냉각시키고, 아크릴로니트릴 850g을 2시간에 걸쳐 상기 용액에 적가하면서 액체 온도를 5℃ 이하로 유지한다. The solution was further cooled to below 5 ℃, while over 2 hours 850g of acrylonitrile was added dropwise to the solution to maintain the liquid temperature below 5 ℃. 첨가 후, 추가로 2시간 동안 지속적으로 교반한다. And added continuously to the stirred for 2 hours after addition. 반응을 종결시킨 후, 반응 혼합물은 85% 인산 60g을 첨가하여 중화시킨다. After completion of the reaction, the reaction mixture is neutralized by addition of 85% phosphoric acid 60g. 이온 교환된 물 7000g중의 염화나트륨 1250g의 용액, 클로로포름 2500㎖ 및 클로로포름 1250㎖을 사용하여 실시예 1과 동일한 방식으로 반응 혼합물을 후처리하여 조 테트라시아노에틸화 테트라(폴리옥시에틸렌) 디글리세롤 1600g을 수득한다. Ion-exchange water solution of sodium chloride, 1250g, chloroform treatment and then the reaction mixture in the same manner as in Example 1 using chloroform and 2500㎖ 1250㎖ crude tetra-dicyano ethylated 7000g of tetra (polyoxyethylene) diglycerol to 1600g It was obtained. 교반기 및 질소 밀봉 시험관이 장착된 30ℓ들이 비이커내에, 조 테트라시아노에틸화 테트라(폴리옥시에틸렌) 디글리세롤(1600g)을 넣고 클로로포름 1.4ℓ속에 용해시킨다. In a sealed tube equipped with a stirrer and a nitrogen 30ℓ to a beaker, into a crude tetra-dicyano ethylated tetra (polyoxyethylene) diglycerol (1600g) was dissolved in chloroform and 1.4ℓ. 에틸 아세테이트 11.1ℓ와 헥산 11.1ℓ의 혼합물을 당해 용액에 부은 다음, 30분 동안 교반하여 결정화시킨다. It is crystallized with ethyl acetate-hexane and stirred 11.1ℓ 11.1ℓ for mixture, and then, 30 minutes poured into a solution of the art. 결정을 여과하여 수집한다. Collect by filtration the crystals. 결정을 다 시 클로로포름 1.4ℓ속에 용해시키고, 에틸 아세테이트(11.1ℓ)와 n-헥산(11.1ℓ)의 다른 혼합물을 상기 클로로포름에 부은 다음, 30분 동안 교반하여 결정화시킨다. The crystals were dissolved in chloroform when 1.4ℓ, poured another mixture of ethyl acetate (11.1ℓ) and n- hexane (11.1ℓ), and then the chloroform, the crystallization by stirring for 30 minutes. 여과하여 수집된, 수득된 결정을 건조시켜 테트라시아노에틸화 테트라(폴리옥시에틸렌) 글리세롤 1400g을 수득한다. The collected by filtration, drying the obtained crystals to give the tetracycline cyano ethylated tetra (polyoxyethylene) glycerol 1400g. 교반기, 온도계, 질소 도입 시험관, 수소-도입 시험관 및 암모니아-도입 시험관이 장착된 1ℓ들이 오토클레이브내에, 테트라시아노에틸화 테트라(폴리옥시에틸렌) 디글리세롤 200g, 톨루엔 400g 및 니켈 촉매 9g을 넣는다. Place the inside equipped with a 1ℓ are autoclave introducing tube, tetra-dicyano ethylated tetra (polyoxyethylene) diglycerol 200g, toluene 400g, and nickel catalysts 9g-stirrer, a thermometer, a nitrogen-introducing tube, a hydrogen-introducing tubes and ammonia. 혼합물을 반응시키고 실시예 1과 동일한 방식으로 후처리하여 테트라(폴리옥시에틸렌) 디글리세롤 테트라프로필 아민 170g을 수득하며, 이의 아민 순도는 93.1%인 것으로 밝혀졌다. The reaction mixture was post-treated in the same manner as in Example 1, tetra (polyoxyethylene) to afford di-glycerol-tetra-propylamine 170g, amine purity thereof was found to be 93.1%. 교반기, 온도계, 콘덴서 및 질소 버블링 시험관이 장착된 1ℓ들이 4목 플라스크내로 테트라(폴리옥시에틸렌) 디글리세롤 테트라프로필아민 164g 및 톨루엔 325㎖를 충전시키고 50℃로 가열하여 용액을 제조한다. Stirrer, thermometer, condenser, and nitrogen bubbling into the test tube, the tetra-equipped four-neck flask are 1ℓ (polyoxyethylene) was charged glycerol di-tetra-propylamine 164g of toluene and heated to 50 ℃ 325㎖ to prepare a solution. 용액에 말레산 무수물 64g을 첨가한 다음, 4시간 동안 교반한다. Was added to 64g of maleic anhydride was added, followed by agitation for 4 hours. 반응 혼합물을 40℃로 냉각시키고, 에틸 아세테이트 800㎖와 헥산 800㎖의 혼합물을 상기 반응 혼합물에 부은 다음, 30분 동안 교반하여 결정화시킨다. The reaction mixture is stirred for crystallization was cooled to 40 ℃, and then, 30 minutes poured into a mixture of ethyl acetate and hexane 800㎖ 800㎖ to the reaction mixture. 여과하여 수집된 결정을 다시 톨루엔 325㎖ 속에 용해시키고, 에틸 아세테이트 800㎖와 헥산 800㎖의 혼합물을 상기 톨루엔에 붓고 혼합물을 30분 동안 교반하여 결정화시킨다. Filtered and the collected crystals are dissolved again in toluene 325㎖, to crystallize the mixture of ethyl acetate and hexane 800㎖ 800㎖ and the mixture was poured into the toluene was stirred for 30 minutes. 여과하여 수집된 결정을 건조시켜 테트 라(폴리옥시에틸렌) 디글리세롤 테트라프로필말레아미드산 167g을 수득하며, 이의 말레산 무수물 함량은 0.025중량%인 것으로 밝혀졌다. Filtered and dried to collect the crystal Tet La (polyoxyethylene) diglycerol and tetrapropyl to give the maleic acid amide 167g, maleic anhydride content thereof was found to be 0.025 wt%. 교반기, 온도계, 콘덴서 및 질소 버블링 시험관이 장착된 1ℓ들이 4목 플라스크내로, 수득된 테트라(폴리옥시에틸렌) 디글리세롤 테트라프로필말레아미드산 167g, 아세트산 무수물 500㎖ 및 나트륨 아세테이트 63g을 충전시킨다. 1ℓ a stirrer, a thermometer, a condenser and a nitrogen-bubbling test tube attached to and filled into a four-neck flask, and the resulting tetra (polyoxyethylene) diglycerol tetra-propyl maleic acid amide 167g, 63g of sodium acetate and acetic anhydride 500㎖. 혼합물을 90℃로 가열하고, 3시간 동안 교반하여 반응을 수행한다. The mixture is heated to 90 ℃, and performs the reaction to stir for 3 hours. 50℃로 냉각시킨 후, 반응 혼합물을 여과하여 나트륨 아세테이트를 제거하고 여과물을 0.3kPa의 감압하에 90℃에서 농축시킨다. After cooling to 50 ℃, then the reaction mixture was filtered to remove sodium acetate and concentrated in 90 ℃ the filtrate under a reduced pressure of 0.3kPa. 농축물을 클로로포름 360㎖속에 용해시키고, 임의 불용성 물질을 여과하여 제거한다. Chloroform 360㎖ dissolved in the concentrate and is removed by filtration any insoluble material. 에틸 아세테이트 1ℓ와 헥산 1ℓ의 혼합물을 여과물에 부은 다음, 30분 동안 교반하여 결정화시킨다. A mixture of ethyl acetate and hexane 1ℓ 1ℓ filtered crystallize with stirring and then poured into water, for 30 minutes. 결정을 여과하여 수집한다. Collect by filtration the crystals. 결정을 다시 클로로포름 360㎖ 속에 용해시키고, 30분 동안 교반하여 또 다른 에틸 아세테이트(1ℓ)와 헥산(1ℓ)의 혼합물로부터 결정화시킨다. It was dissolved in chloroform to determine 360㎖ again and stirred for 30 minutes to crystallize from a mixture of other ethyl acetate (1ℓ) and hexane (1ℓ). 여과하여 수집된 결정을 건조시켜 연분홍색 테트라(폴리옥시에틸렌) 디글리세롤 테트라프로필말레이미드 162g을 수득한다. Drying the crystals collected by filtration pinky tetra (polyoxyethylene) to give a glycerol-di-tetra-propyl maleimide 162g. 메톡시폴리옥시에틸렌 에틸말레이미드를 문헌[참조: Synthetic Communications, 22(16) (1992), pp. 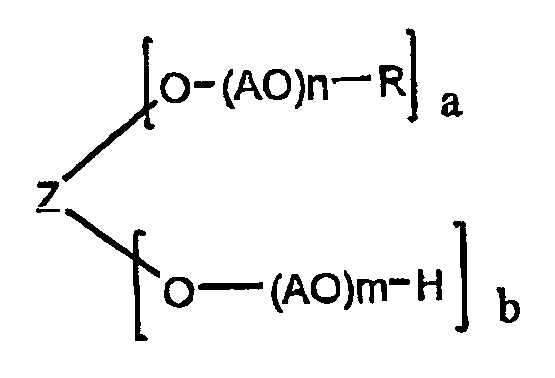 Methoxy-polyoxyethylene ethyl maleimide in the literature [see: Synthetic Communications, 22 (16) (1992), pp. 2425-2429]에 기재되어 있는 방법에 의해 메톡시폴리옥시에틸렌 프로필아민(분자량: 5000)으로부터 합성한다. It is synthesized from: (molecular weight 5000) 2425-2429] methoxy polyoxyethylene propylamine by the method described. 출발 메톡시폴리옥시에틸렌 프로필아민은 실시예 1과 동일한 물질 및 방법을 사용하여 시안화 및 아미노화에 의해 제조한다. From methoxy polyoxyethylene propylamine it is prepared by using the same materials and methods as in Example 1, by cyanation and amination. 수득되는 메톡시폴리옥시에틸렌 프로필아민은 아민 순도가 96.8%이다. Methoxy polyoxyethylene propylamine obtained is an amine purity of 96.8%. 50㎖들이 플라스크내로 메톡시폴리옥시에틸렌 프로필아민 2.5g, 말레산 무수물 460mg 및 디옥산 10㎖을 충전시키고 80℃에서 30분 동안 교반하여 반응시킨다. 50㎖ are reacted into the flask methoxy polyoxyethylene propylamine 2.5g, maleic anhydride was charged to 460mg and dioxane 10㎖ stirred at 80 ℃ for 30 minutes. 냉각시킨 후, 디에틸 에테르 500㎖를 상기 반응 혼합물에 붓고, 혼합물을 밤새 정치시켜 결정화시킨다. This was cooled, poured into diethyl ether 500㎖ to the reaction mixture, and the mixture is crystallized to stand overnight. 결정을 여과하여 수집하고 디에틸 에테르로 세척하고 진공에서 건조시켜 메톡시폴리옥시에틸렌 프로필말레아미드산을 수득하며, 이의 말레산 무수물 함량은 0.086중량%인 것으로 밝혀졌다. And was collected by filtration and the crystals were washed with diethyl ether and dried in vacuo to give the methoxy polyoxyethylene propyl maleic acid amide, maleic anhydride content thereof was found to be 0.086% by weight. 50㎖들이 플라스크에, 수득된 메톡시폴리옥시에틸렌 프로필말레아미드산, 아세트산 무수물 20㎖ 및 나트륨 아세테이트 1.0g을 넣고, 혼합물을 100℃에서 45분 동안 교반하여 반응을 수행한다. 50㎖ to the flask, placed into a methoxy polyoxyethylene propyl maleic acid amide, acid anhydride and sodium acetate 1.0g 20㎖ obtained, the mixture is carried out and the reaction mixture was stirred at 100 ℃ for 45 minutes. 냉각시킨 후, 반응 혼합물을 증발시켜 용매를 제거한다. Evaporation of the cooled reaction mixture to remove the solvent. 잔사를 디클로로메탄 50㎖속에 용해시키고 활성탄으로 처리하고, 이후에 상기 활성탄을 여과하여 제거한다. The residue was dissolved in dichloromethane 50㎖ and treated with activated charcoal, and removed by the activated carbon filter in the future. 여과물에 디에틸 에테르 500㎖을 첨가하고, 당해 시스템을 밤새 정치시킨다. Filtered, it added to diethyl ether 500㎖ in water and allowed to stand overnight the art system. 침전된 결정을 여과하여 수집하고 디에틸 에테르로 세척하고 진공에서 건조시켜 연분홍색 메톡시폴리옥시에틸렌 프로필말레이미드 2.2g을 수득한다. Filtered to collect the precipitated crystals were washed with diethyl ether to give a light pink-methoxy polyoxyethylene propyl maleimide 2.2g and dried in a vacuum. 메톡시폴리에틸렌 프로필아민은 실시예 1과 동일한 물질 및 동일한 방법을 사용하여 시안화 및 아미노화에 의해 제조하다. Methoxy polyethylene propylamine is prepared by cyanation and amination using the same materials and the same manner as in Example 1. 수득되는 메톡시폴리옥시에틸렌 프로필아민은 아민 순도가 98.8%이다. Methoxy polyoxyethylene propylamine obtained is an amine purity of 98.8%. 교반기, 온도계, 콘덴서 및 질소 버블링 시험관이 장착된 1ℓ들이 4목 플라 스크에 메톡시폴리옥시에틸렌 프로필아민 164g 및 톨루엔 325㎖을 놓은 다음, 50℃로 가열하여 용액을 제조한다. Heating 1ℓ a stirrer, a thermometer, a condenser and a nitrogen-bubbling test tube attached to the sewn-methoxy polyoxyethylene propylamine and 164g of toluene in a four-neck 325㎖ Plastic disk to the next, 50 ℃ to prepare a solution. 상기 용액에 말레산 무수물 32g을 첨가하고, 혼합물을 4시간 동안 교반하여 반응을 수행한다. It was added to 32g of maleic anhydride to the solution and the mixture to carry out the reaction and stirred for 4 hours. 반응을 종결시킨 후, 반응 혼합물의 분취액을 분석하여 말레산 무수물 함량이 15중량%임을 밝혀낸다. After completion of the reaction, by analyzing an aliquot of the reaction mixture reveals that the maleic anhydride content of 15% by weight. 반응 혼합물에 아세트산 무수물 500㎖ 및 나트륨 아세테이트 64g을 첨가하고, 혼합물을 90℃로 가열한다. It was added acetic anhydride 500㎖ 64g and sodium acetate to the reaction mixture, and the mixture was heated to 90 ℃. 반응 혼합물을 실시예 1과 동일한 방식으로 후처리하여 진갈색 메톡시폴리옥시에틸렌 프로필말레이미드 결정 164g을 수득한다. It was treated in the same manner after the reaction mixture as in Example 1, to obtain a dark brown-methoxy polyoxyethylene propyl maleimide crystal 164g. 시판되는 메톡시프로필에틸렌 글리콜 말레이미드(메톡시폴리에틸렌 글리콜 5,000 말레이미드, 제품 번호 63187, 공급원: Fluka, 분자량: 5000)을 비교 실시예 3과 같이 분석한다. Methoxypropyl glycol-maleimide commercially available (methoxy polyethylene glycol 5,000 maleimide, Product No. 63 187, source: Fluka, molecular weight: 5000) and analyzed as in Comparative Example 3. 실시예 1 내지 3 및 비교 실시예 1 내지 3의 폴리옥시알킬렌 유도체를 GPC 순도 및 말레이미도 그룹 치환도에 대해 분석한다. The embodiment examples 1 to 3 and Comparative Examples 1 to 3 Poly analysis for the polyoxyalkylene derivative to GPC purity and maleimido group substitution degree. 결과는 하기 표 1에 제시한다. Results are shown in Table 1 below. 본 발명의 방법에 의해 수득된 폴리옥시알킬렌 유도체는 고 GPC 순도 및 고 말레이미도 그룹 치환도를 나타내는 반면, 본 발명의 범주에서 벗어나는 비교 실시 예의 폴리옥시알킬렌 유도체는 특성 둘다가 불만족스러운 것으로 보인다. The polyoxyalkylene derivatives obtained by the method of the present invention is a high GPC purity and a high whereas maleimido group that represents the degree of substitution, comparative example polyoxyalkylene derivatives out of the scope of the invention is likely to sense the characteristics both of unsatisfactory . 실시예 1 및 비교 실시예 3에서 제조된 폴리옥시알킬렌 유도체를 다음 시험 방법에 따라서 가수분해 안정성 및 이를 사용하여 개질시킨 리소자임의 안정성에 대해 시험한다. 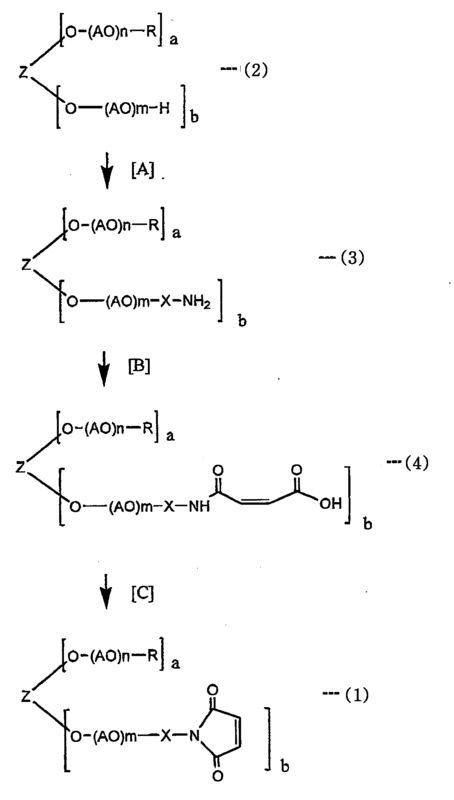 Example 1 and the comparative example polyoxyalkylene derivatives prepared in Example 3 according to the following test method and tested for hydrolysis stability and stability of lysozyme was modified by using the same. 중량이 0.1g인 샘플을 50㎖들이 스크류 유리병에 넣고 pH 7로 조정된 50mM 인산 완충액 100㎖ 속에 용해시키고, 당해 용액을 23℃에서 정치시킨다. The sample, weighing 0.1g 50㎖ were placed in a screw vial and dissolved in a 50mM phosphate buffer, adjusted to pH 7 100㎖, then the value in the solution 23 ℃. 24시간, 48시간 또는 72시간 동안 정치시킨 후에 수거된 4㎖ 분취액을 몇 방울의 1% 인산 수용액과 혼합하고 동결건조시킨다. Mixed with 24, 48 hours or 72 1% aqueous solution of phosphoric acid in which the 4㎖ aliquot few drops collected after standing for hours, and then lyophilized. 고체를 클로로포름속에 용해시키고 불용성 물질을 여과하여 제거한다. The solid was dissolved in chloroform and the insolubles were filtered off. 여과물을 진공에서 농축시켜 샘플을 제조하고, 이를 1 H-NMR로 분석하여 말레이미도 그룹 치환도를 측정한다. Concentration of the filtrate in vacuo to prepare a sample, and analyzes it by 1 H-NMR to measure the maleimido group substitution degree. 초기 값과 비교하여, 각 측정 시간에서의 말레이미도 그룹 치환도의 잔류비(%)는 하기 표 2에 제시된 바와 같다. Compared to the initial value, as maleimido group to the residual ratio (%) of the substitution degree at each measurement time shown in Table 2. 당해 결과로부터 계산된, 실시예 1의 50% 감소 시간(반감기), 25% 감소 시간 및 70% 감소 시간은 각각 67시간, 33시간 및 94시간이며, 비교 실시예 1의 50% 감소 시간(반감기), 25% 감소 시간 및 70% 감소 시간은 각각 46시간, 23시간 및 64시 간이다. 50% reduction time (half-life of the Example and 50% reduction time (half-life), 25% reduction time, and 70% reduction time of 1 is respectively 67 hours, 33 hours and 94 hours, Comparative Example 1 calculated from the art results ), 25% reduction time, and 70% reduction time is a time each 46 hours, 23 hours and 64. 닭의 난백 리소자임을 인산 완충액(pH 7.4)속에 용해시켜 0.5mM 용액을 제조하고 이를 4℃로 냉각시킨다. By dissolving the egg white of the chicken lysozyme in phosphate buffer (pH 7.4) thereby producing a 0.5mM solution was cooled to 4 ℃. 상기 용액에 리소자임으로서 2-이미노티올란 하이드로클로라이드(공급원: Aldrich Chemical Co.)의 몰량의 2.5배를 첨가하고 당해 시스템을 밤새 교반하여 리신 잔기의 측쇄 아미노 그룹을 티올 그룹으로 전환시킨다. A lysozyme solution to the 2-iminothiolane hydrochloride: to convert the (source Aldrich Chemical Co.) the side chain amino group of lysine residues to 2.5 times of the addition to the art system, the molar amount of the thiol group to stir overnight. 이어서 반응 혼합물에 리소자임으로서 2배 몰 과량의 실시예 1 또는 비교 실시예 3의 말레이미도-말단화된 폴리옥시알킬렌 유도체를 첨가하고 당해 시스템을 3시간 동안 반응시키면서 냉각시킨다. Then maleimido embodiment of molar excess of twice as lysozyme to the reaction mixture in Example 1 or Comparative Example 3 - it is added to the terminated polyoxyalkylene derivative, and while cooling the reaction system for 3 hours. 무기 염을 탈염시킨 후, 여과물을 동결건조시켜 폴리옥시알킬렌 유도체로 개질된 리소자임을 수득한다. After desalting inorganic salts, filtered, freeze-drying the water to obtain the lysozyme modified with a polyoxyalkylene derivative. 개질된 리소자임의 0.1g 분취액을 칭량하고 10mM 인산 완충액(pH 7.0; 0.1% 메틸 4-하이드록시벤조에이트를 함유함) 20㎖속에 용해시키고, 용액을 40℃에서 보관한다. Weighed 0.1g aliquots of the modified lysozyme and 10mM phosphate buffer; was dissolved in (pH 7.0 also containing 0.1% methyl 4-hydroxybenzoate) 20㎖, and store the solution at 40 ℃. 규정된 시간 동안 보관한 후 개질된 리소자임의 활성을 다음과 같은 측정한다. During the prescribed time and then keep the activity of the modified lysozyme and following measurements. 마이크로코커스 리소데이크틱스(Micrococcus lysodeiktics)의 무수 미생물 세포의 적당량과 75mM 인산나트륨(pH 6.2)을 진탕시켜 혼합함으로써, 75mM 인산나트륨 수용액을 대조군으로서 사용하여 640nM에서 1.00의 흡광도를 수득하도록 농도를 조정한 기질 용액을 제조한다. Micro Lactococcus resources deyikeu vertices by mixing by shaking a suitable amount and 75mM sodium phosphate (pH 6.2) of dry microbial cells of (Micrococcus lysodeiktics), using 75mM sodium phosphate aqueous solution as a control and adjusting the concentration to give an absorbance of 1.00 at 640nM to prepare a substrate solution. 개질된 리소자임을 정제수속에 용해시켜 리소자임 5 내지 15㎍/g을 함유하는 샘플 용액을 제조한다. By dissolving the modified lysozyme in purified water to prepare a sample solution containing 5 to lysozyme 15㎍ / g.
37℃에서 보관한 기질 용액 3.0㎖에 샘플 용액 0.1㎖을 첨가한다. And a sample solution is added to a substrate solution 0.1㎖ 3.0㎖ stored at 37 ℃. 교반한 후, 640nm에서의 흡광도를 대조군으로서 75mM 인산나트륨 수용액을 사용하여 측정한다. After stirring, the absorbance at 640nm is measured using 75mM sodium phosphate aqueous solution as a control. 초기 리소자임 활성을 100으로 하여, 규정된 시간 후의 활성 잔류비(%)를 흡광도로부터 계산한다. The initial lysozyme activity in 100, calculates a prescribed time after the activity residual ratio (%) from the absorbance. 결과는 하기 표 3에 제시한다. Results are shown in Table 3 below. 표 2 및 3에 제시된 결과는 폴리옥시알킬렌 쇄와 말레이미도 말단 그룹 사이에 C 2 알킬 그룹을 가지는, 비교 실시예 3의 폴리옥시알킬렌 유도체가 효소의 개질 전 및 후의 안정성에 있어 실시예 1의 화합물보다 불량하다는 것을 입증한다. Table 2 and the results set forth in 3, the polyoxyalkylene chain and the maleimido embodiment has a C 2 alkyl group between the end group and Comparative Example 3. The polyoxyalkylene derivatives are in modified before and after the stability of the enzyme of Example 1 It proves to be worse than that of the compound. 본 출원은 2001년 7월 31일자로 출원된 일본 특허원 제JP 2001-231045호에 기초하며, 이의 전문은 본원에서 참조로 인용되며 앞에서 상세히 설명한 바와 같다. This application is based on Japanese Patent Application No. JP 2001-231045, filed on July 31, 2001, specialized thereof are as described and incorporated by reference herein described in detail above. 본 발명은, 생물학적 물질 및 약물 전달 시스템을 개질시키는데 유용하며, 저장 안정성이 우수한 고순도 폴리옥시알킬렌 유도체 및 이를 제조하는 방법을 제공한다. The invention, and useful in modifying the biological substance and a drug delivery system, there is provided a method for the storage stability is excellent manufacturing high purity polyoxyalkylene derivative and this. 제1항에 있어서, GPC 순도가 90% 이상이고 말레이미도 그룹 치환도가 90% 이상인 폴리옥시알킬렌 유도체. According to claim 1, GPC purity of the polyoxyalkylene derivative is more than 90% or more maleimido group substitution degree of 90%. 제1항에 있어서, 말레이미도 그룹 치환도 반감기(50% 감소 시간)가 pH 7 및 23℃에서 수행된 가수분해 안정성 시험에서 48시간 이상인 폴리옥시알킬렌 유도체. The method of claim 1, wherein the maleimido group substitution degree half-life (50% reduction time) a polyoxyalkylene derivative at least 48 hours in a hydrolysis stability test performed at pH 7 and 23 ℃. 제2항에 있어서, 말레이미도 그룹 치환도 반감기(50% 감소 시간)가 pH 7 및 23℃에서 수행된 가수분해 안정성 시험에서 48시간 이상인 폴리옥시알킬렌 유도체. The method of claim 2, wherein the maleimido group substitution degree half-life (50% reduction time) a polyoxyalkylene derivative at least 48 hours in a hydrolysis stability test performed at pH 7 and 23 ℃. 제1항에 있어서, Z가 3 내지 8개의 하이드록실 그룹을 갖는 화합물의 잔기이며 a 및 b가 식 3≤a+b≤8을 만족시키는 폴리옥시알킬렌 유도체. The method of claim 1, wherein, Z is a residue of a compound having 3 to 8 hydroxyl groups and a polyoxyalkylene derivative of b satisfies the equation 3≤a + b≤8. 제2항에 있어서, Z가 3 내지 8개의 하이드록실 그룹을 갖는 화합물의 잔기이며 a 및 b가 식 3≤a+b≤8을 만족시키는 폴리옥시알킬렌 유도체. The method of claim 2, wherein, Z is a residue of a compound having 3 to 8 hydroxyl groups and a polyoxyalkylene derivative of b satisfies the equation 3≤a + b≤8. 제3항에 있어서, Z가 3 내지 8개의 하이드록실 그룹을 갖는 화합물의 잔기이며 a 및 b가 식 3≤a+b≤8을 만족시키는 폴리옥시알킬렌 유도체. The method of claim 3 wherein, Z is a residue of a compound having 3 to 8 hydroxyl groups and a polyoxyalkylene derivative of b satisfies the equation 3≤a + b≤8. 제1항에 있어서, 생물학적 물질을 개질시키는데 사용되는 폴리옥시알킬렌 유도체. The method of claim 1, wherein the polyoxyalkylene derivative used to modify a biological substance. 제1항에 있어서, X가 탄소수 3의 2가 탄화수소 그룹인 폴리옥시알킬렌 유도체. According to claim 1, wherein the polyoxyalkylene derivative X is a divalent hydrocarbon group having a carbon number of 3. 제2항에 있어서, X가 탄소수 3의 2가 탄화수소 그룹인 폴리옥시알킬렌 유도체. The method of claim 2, wherein the polyoxyalkylene derivative X is a divalent hydrocarbon group having a carbon number of 3. 제3항에 있어서, X가 탄소수 3의 2가 탄화수소 그룹인 폴리옥시알킬렌 유도체. The method of claim 3, wherein the polyoxyalkylene derivative X is a divalent hydrocarbon group having a carbon number of 3. 화학식 4의 화합물의 말레아미드산 말단 그룹을 이미드화시키는 단계를 포함하는, 화학식 1의 폴리옥시알킬렌 유도체의 제조방법. The method of producing a polyoxyalkylene derivative of formula (1) that already contains the de solidifying step the maleic acid amide end groups of the compound of formula (4). 제12항에 있어서, 화학식 4의 말레아미드산-말단화된 폴리옥시알킬렌 유도체의 말레산 무수물 함량이 0.5중량% 이하인, 화학식 1의 폴리옥시알킬렌 유도체의 제조방법. The method of claim 12, wherein a maleic acid amide of the formula (4) - end of method of producing a maleic anhydride content of the shoe polyoxyalkylene derivative is 0.5% by weight or less, of the formula (1) poly oxyalkylene derivative. 제13항에 있어서, 화학식 4의 말레아미드산-말단화된 폴리옥시알킬렌 유도체의 말레산 무수물 함량이 0.5중량% 이하인, 화학식 1의 폴리옥시알킬렌 유도체의 제조방법. The method of claim 13, wherein the maleic acid amide of the formula (4) - end of method of producing a maleic anhydride content of the shoe polyoxyalkylene derivative is 0.5% by weight or less, of the formula (1) poly oxyalkylene derivative. ES2321800T3 (en) 2009-06-12 Process for preparing 1-benzotriazolyl esters carbonate water-soluble polymers.